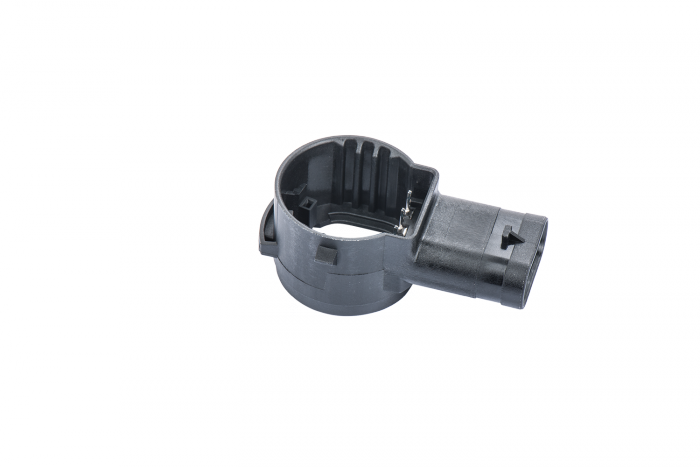 Promotech specializes in the development and manufacturing of contact components and sensor housings for the automotive industry. 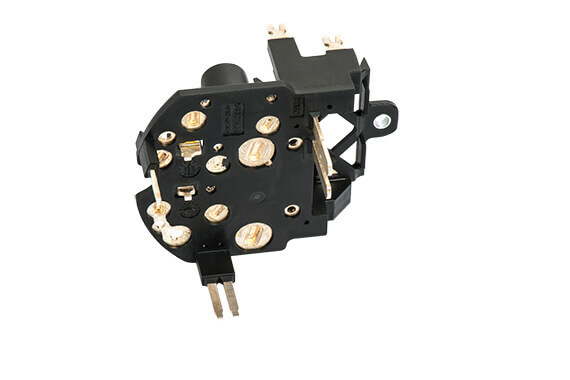 Components are as individual as human beings – each one is absolutely unique in the perfect interaction of its manifold details. 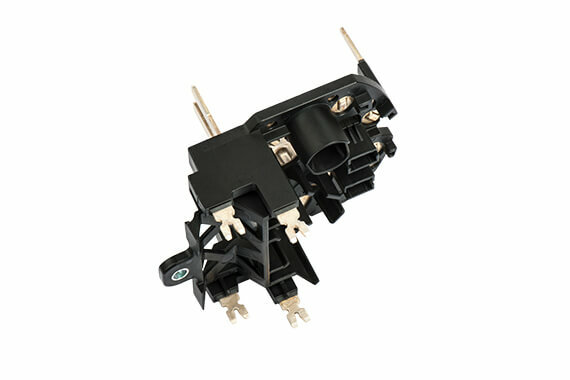 Take a look at our components in 360 degree panoramic view! 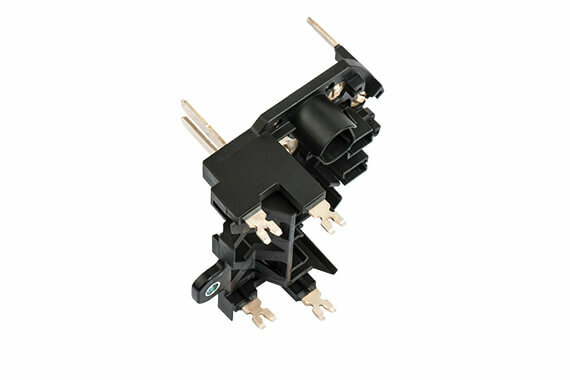 Special “needle eye construction” of the contacts results in cold welding with the circuit board. 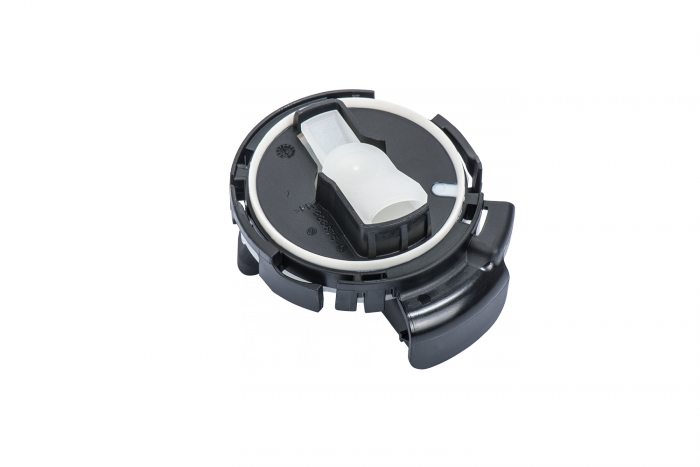 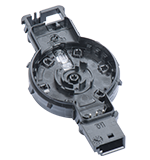 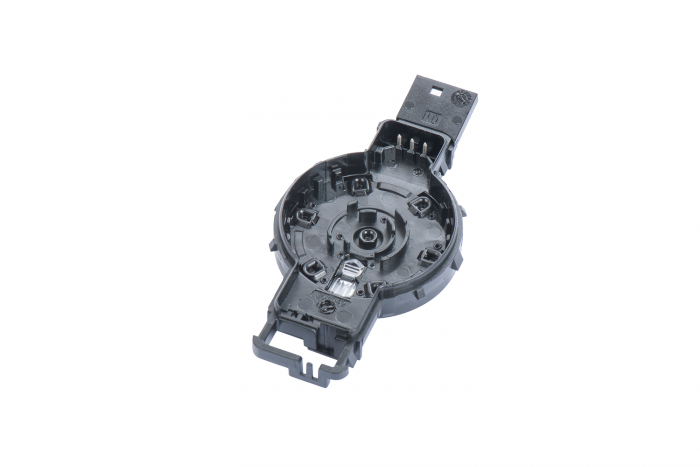 Control elements with up to 10 contacts, automatically bent, placed, injection molded and tested. 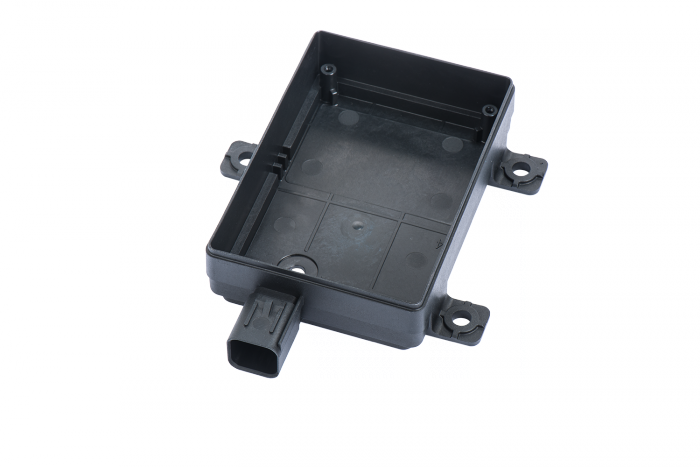 Consists of 3 components: housing for electronics, component for air inlet including membrane, and cover. 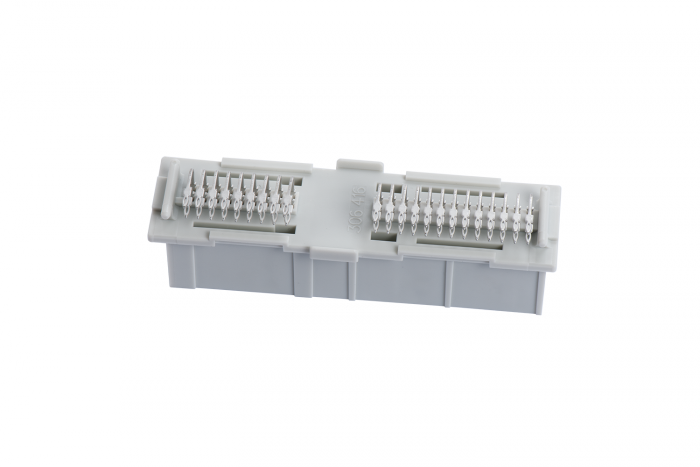 With inserted contacts and optical plastic elements from different materials. 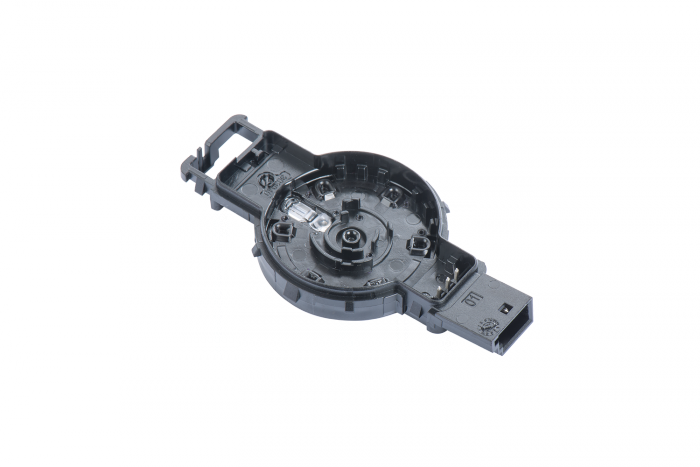 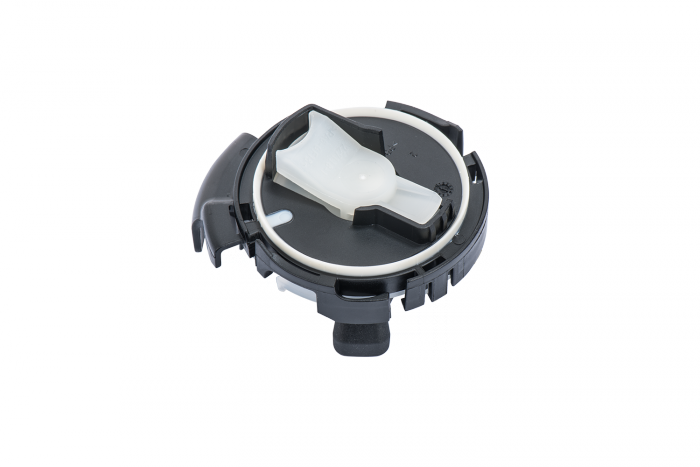 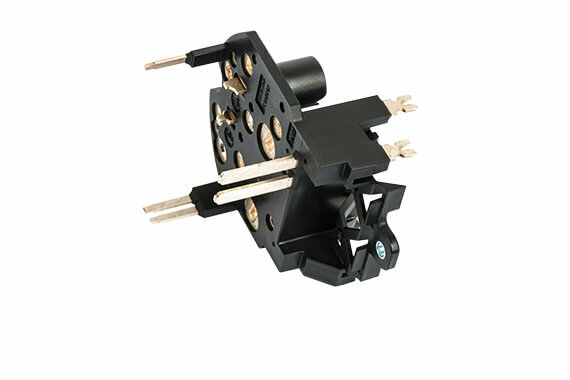 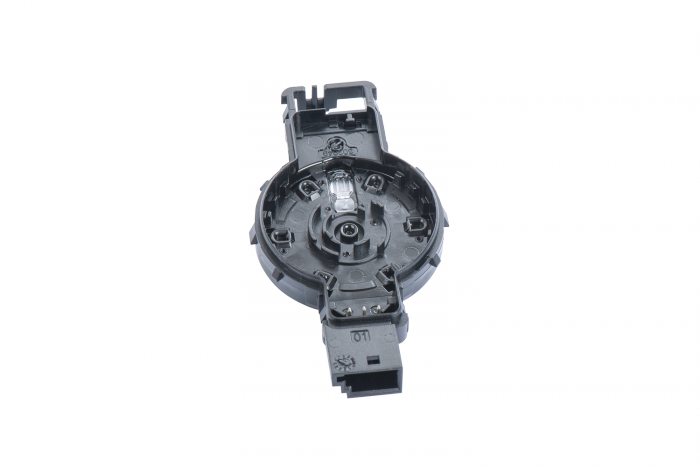 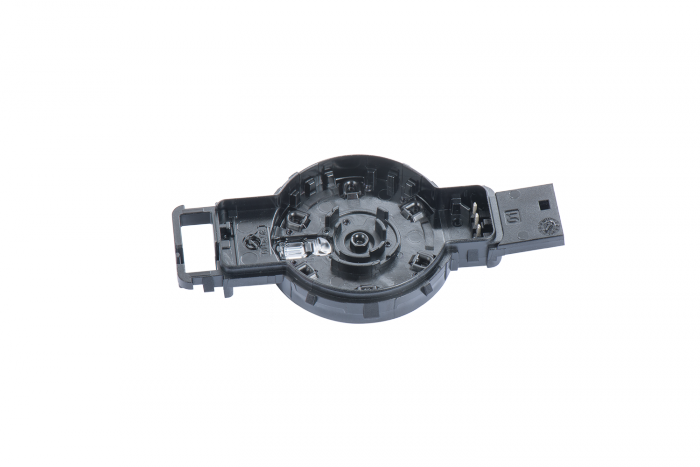 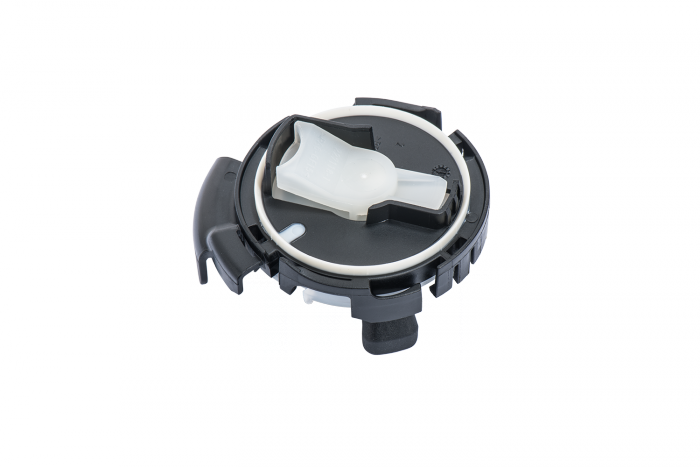 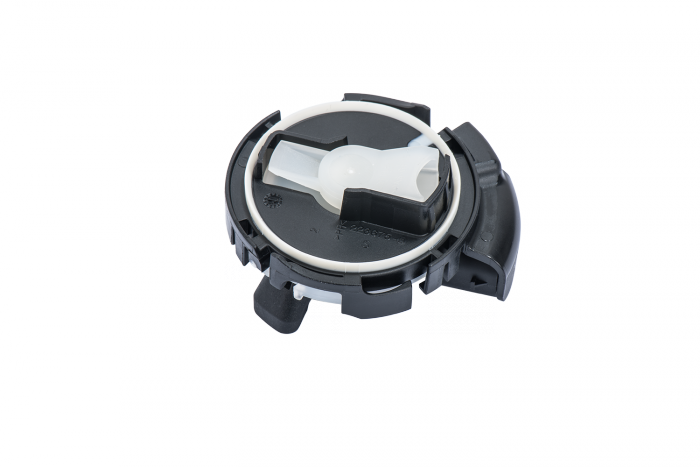 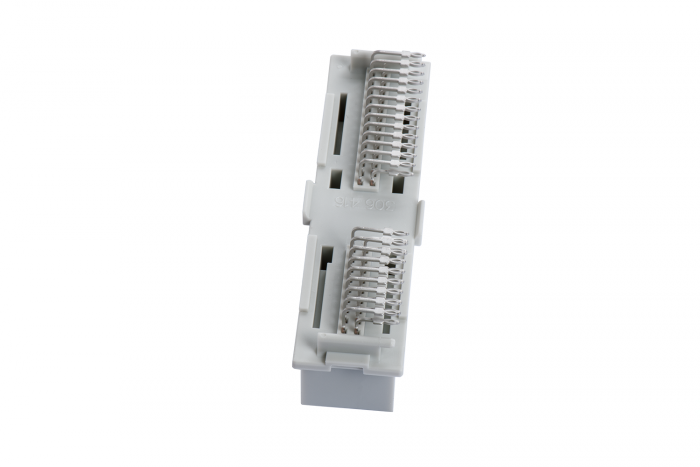 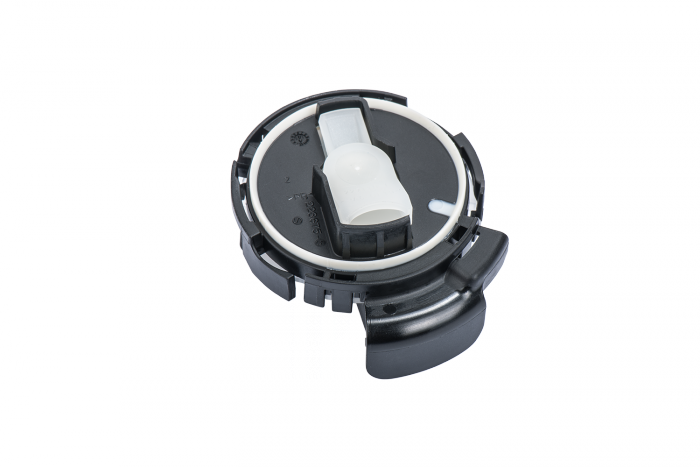 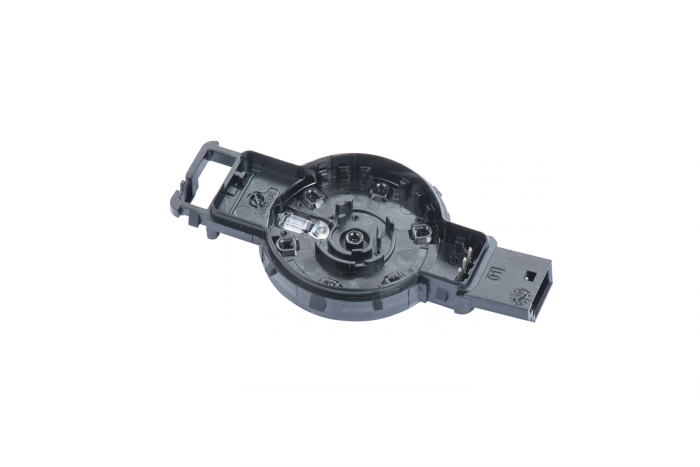 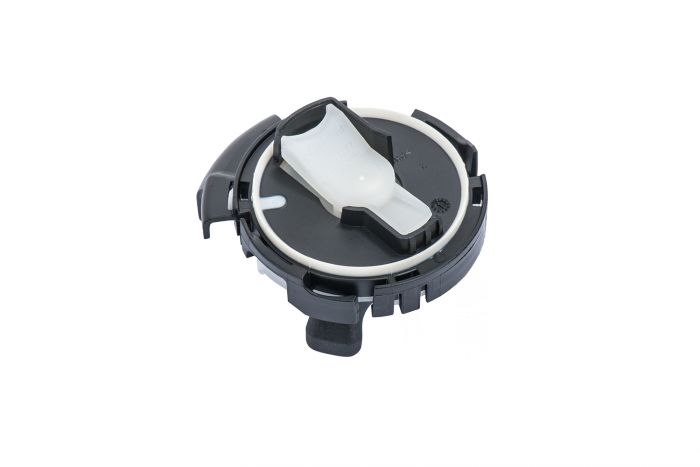 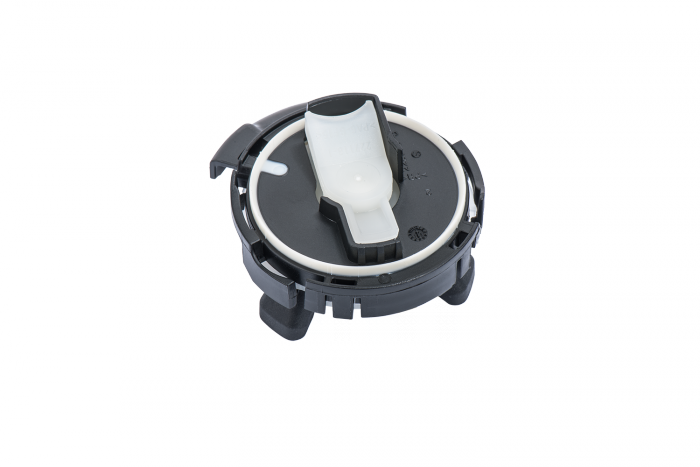 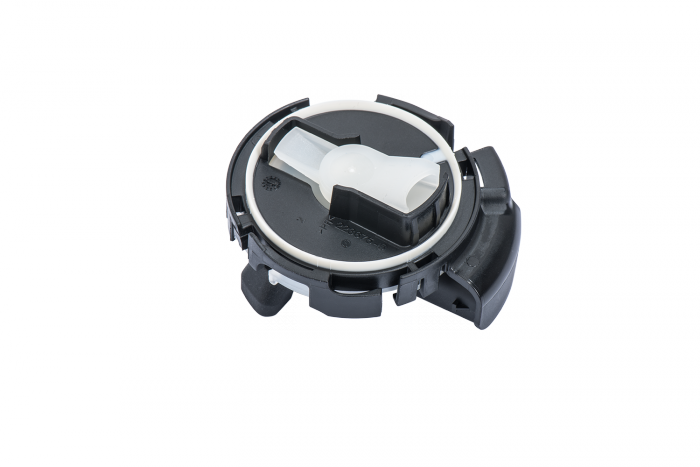 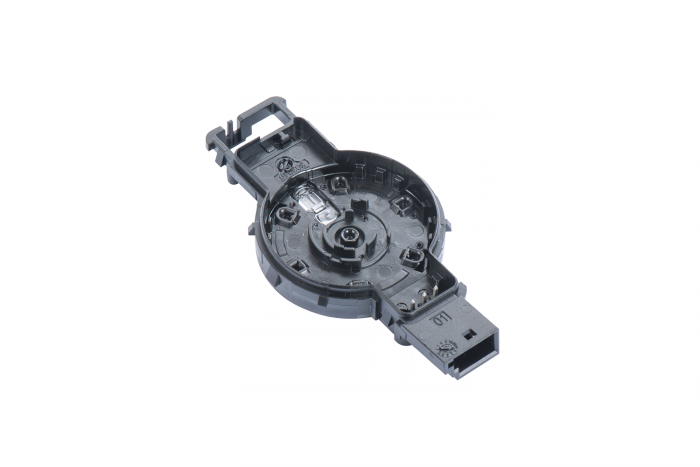 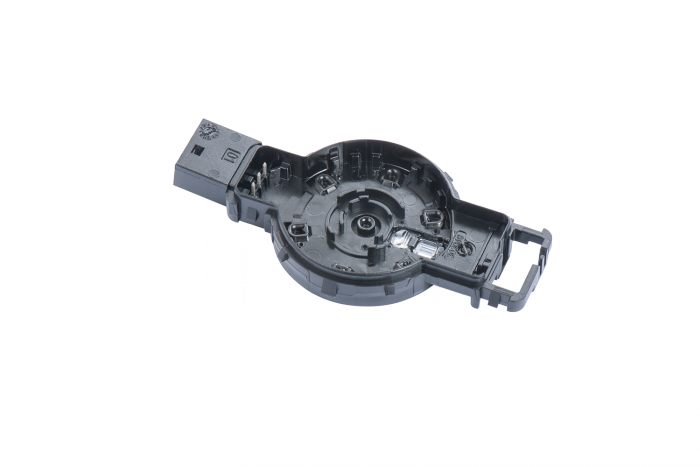 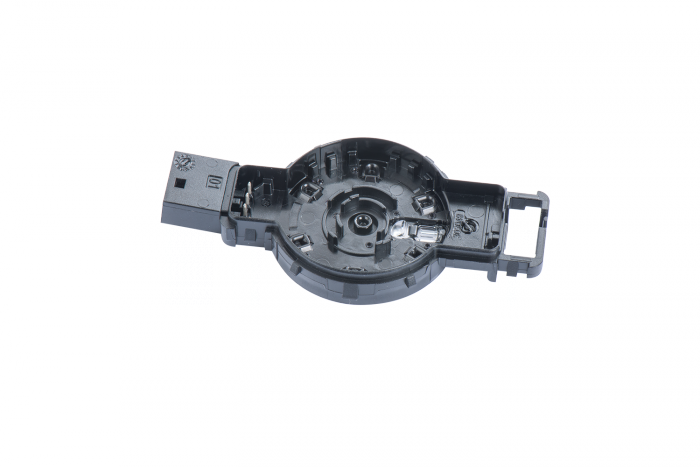 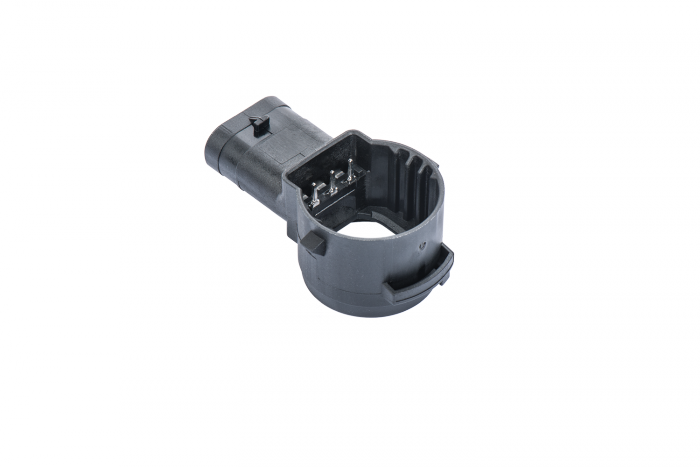 Injection molded contacts made of conductive and non-conductive plastic manufactured in the same operation. 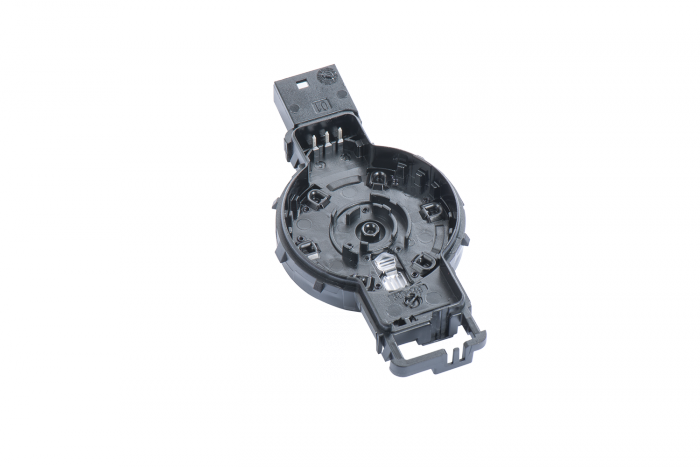 Manufactured in highest precision and large quantities. 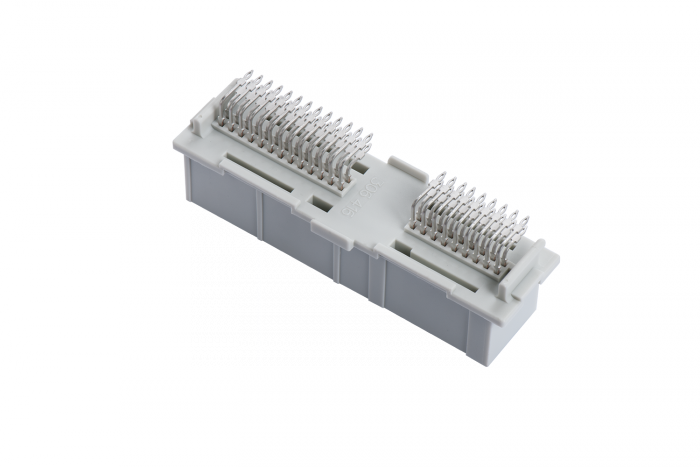 ECU connectors represent the connection between the print circuit board and the connectors. 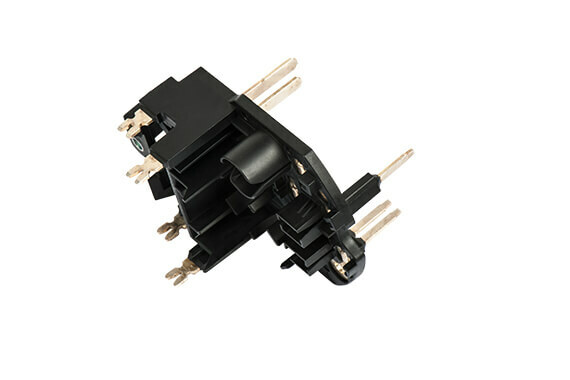 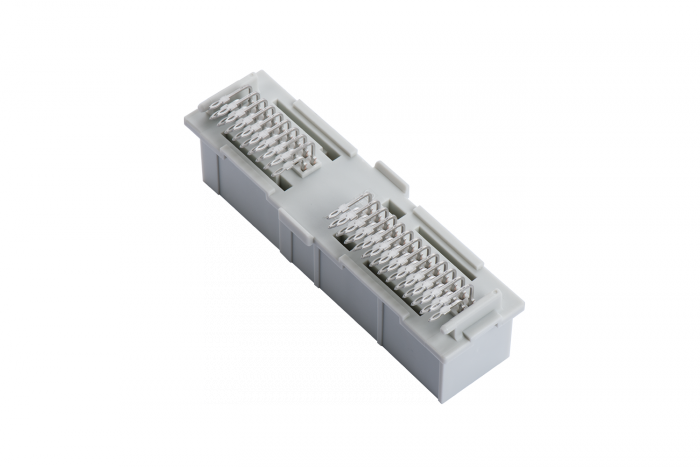 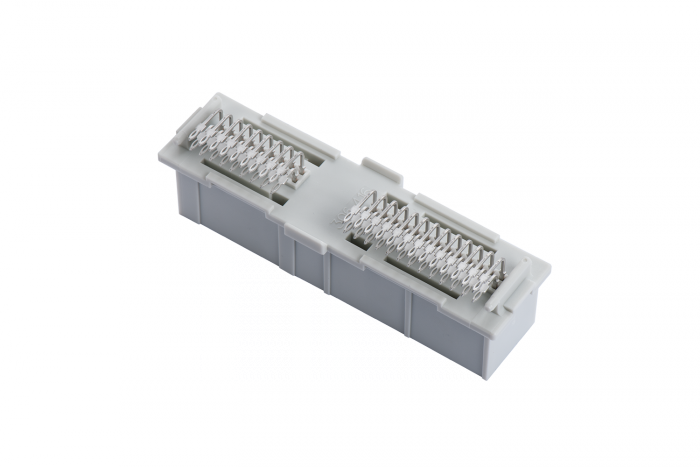 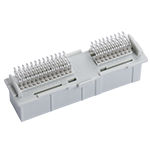 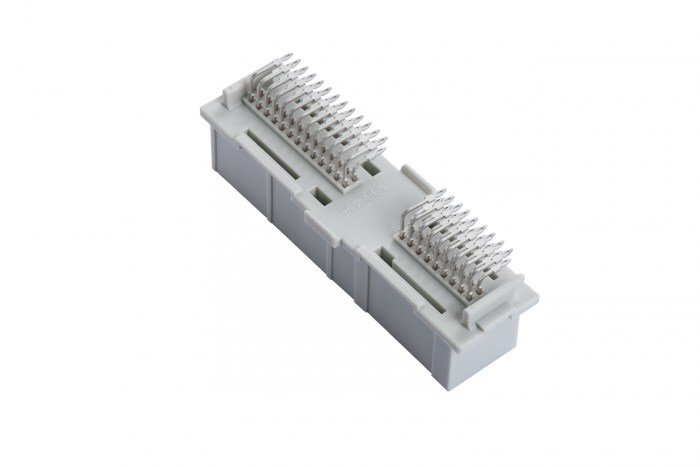 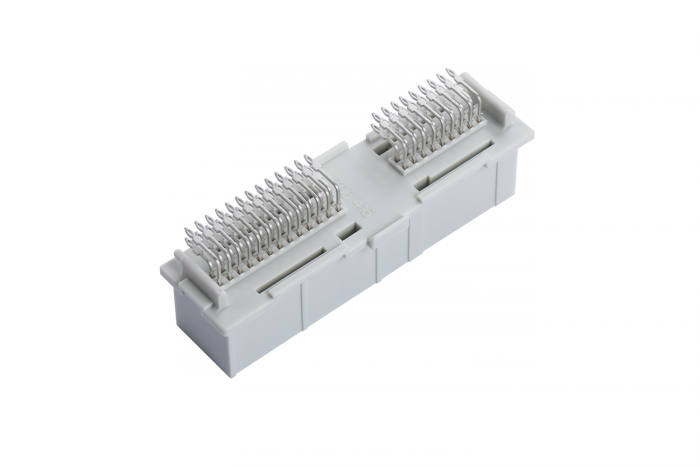 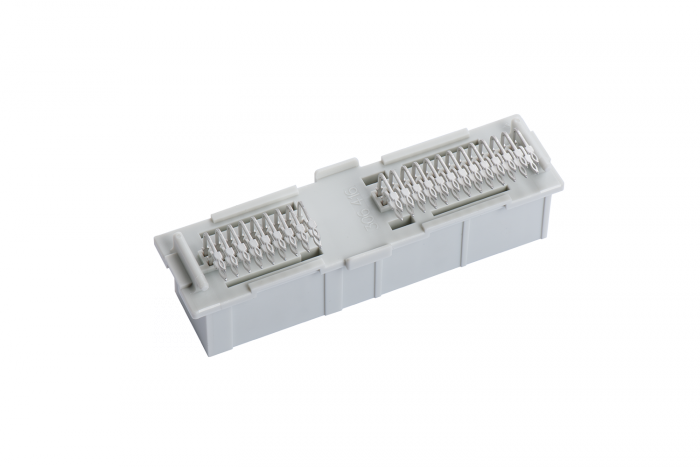 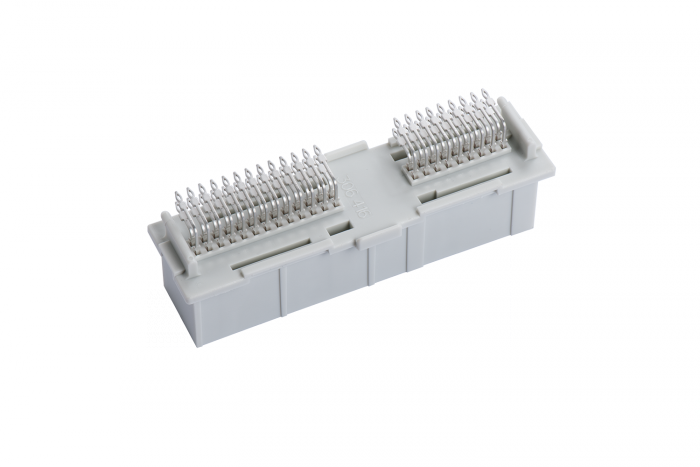 These connectors are particularly indispensable in control units. 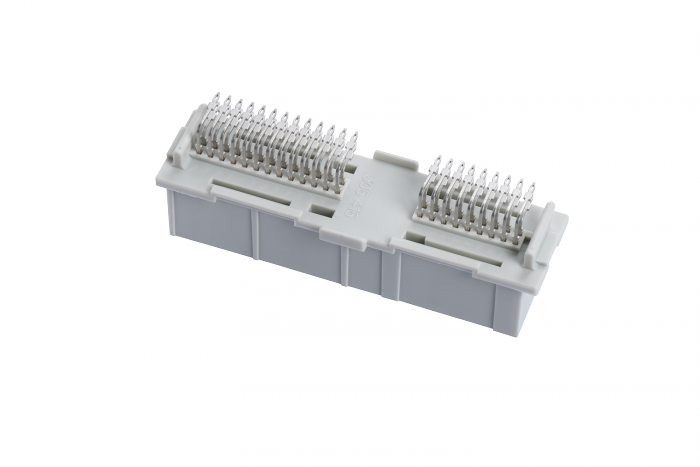 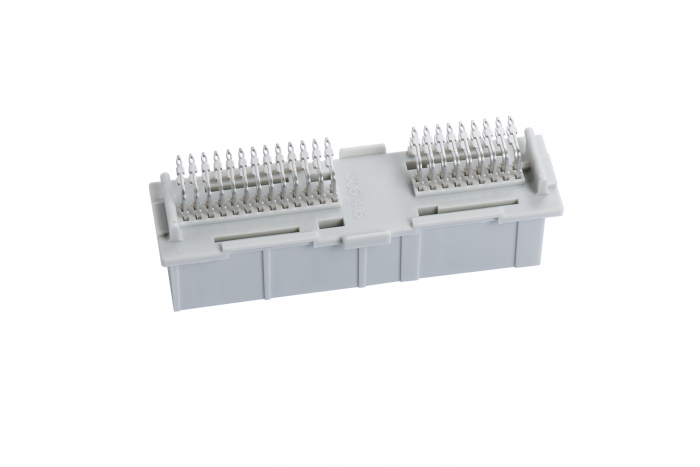 ECU connectors are equipped with up to 70 contacts. 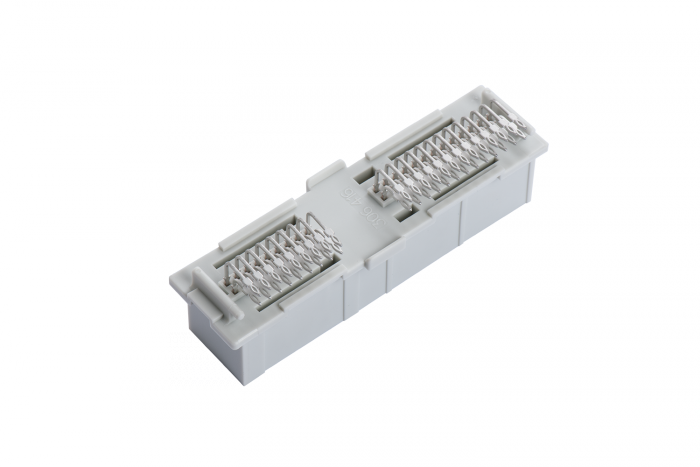 These contacts can be either solder contacts or also press-fit contacts. 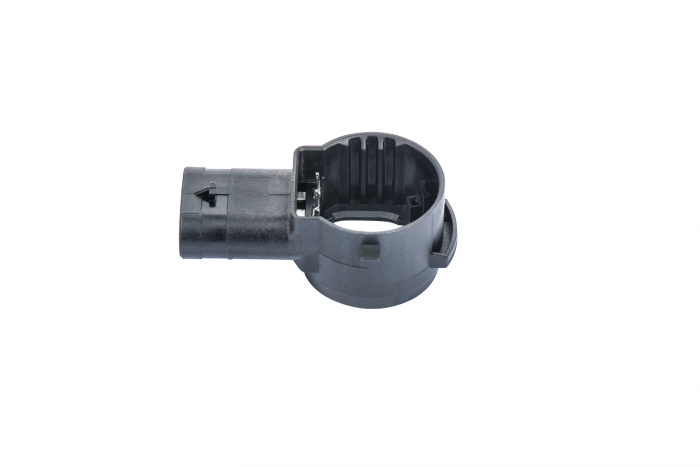 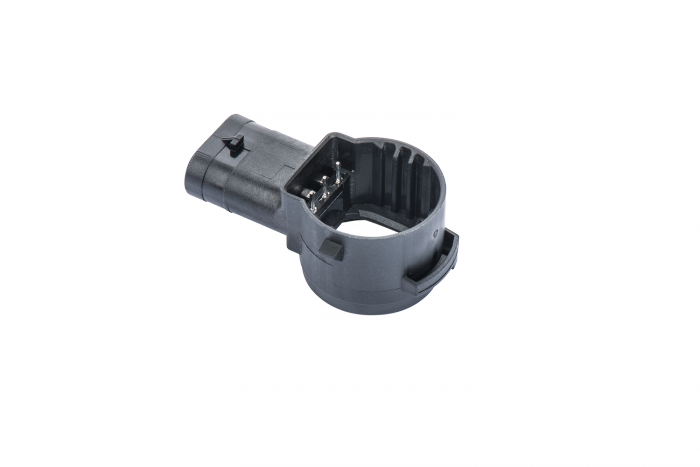 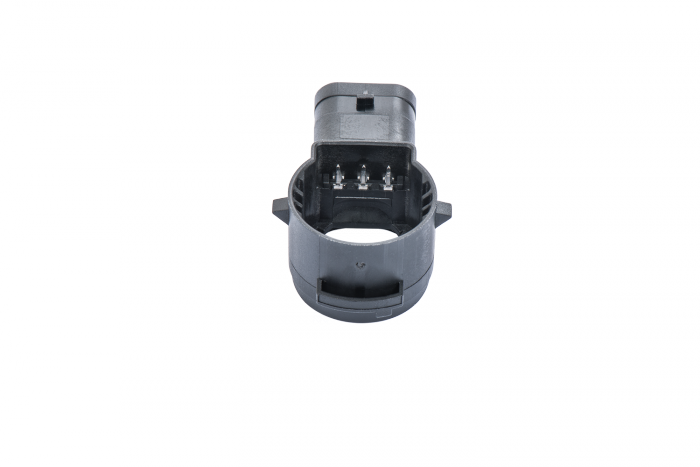 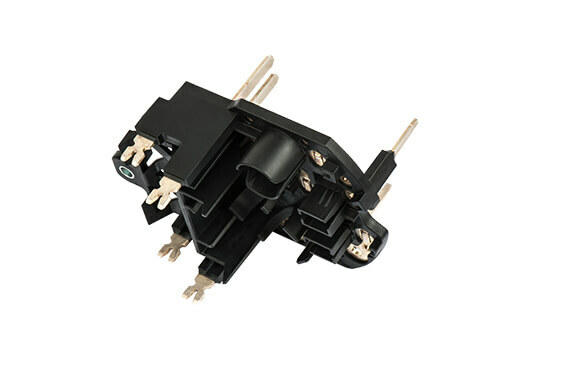 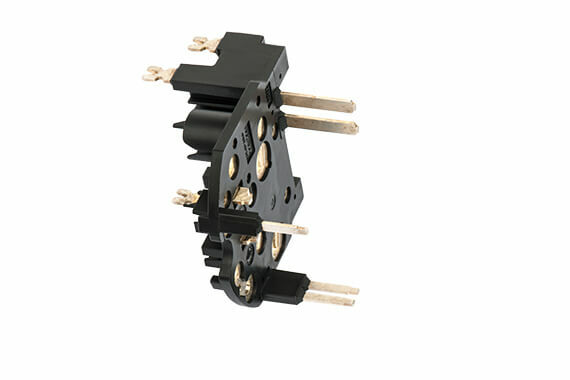 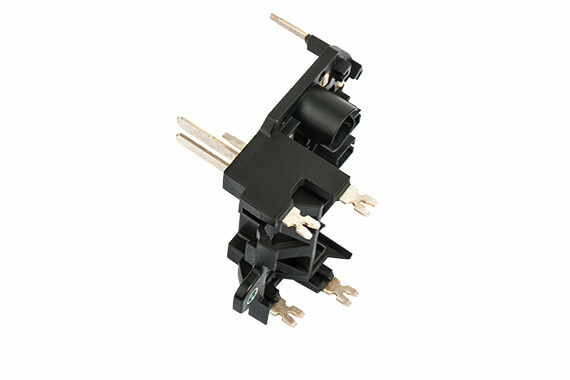 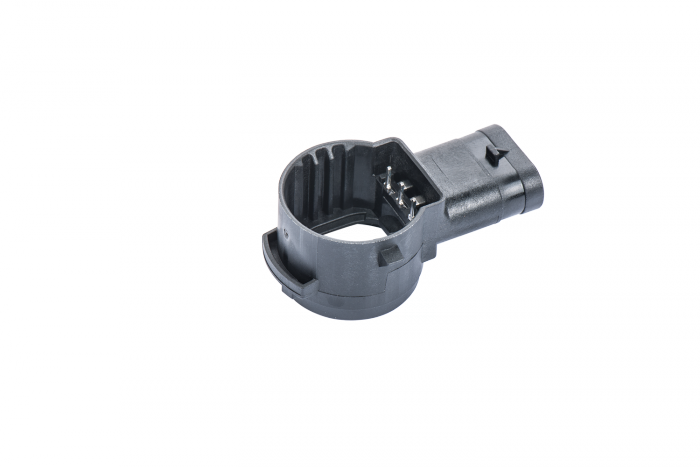 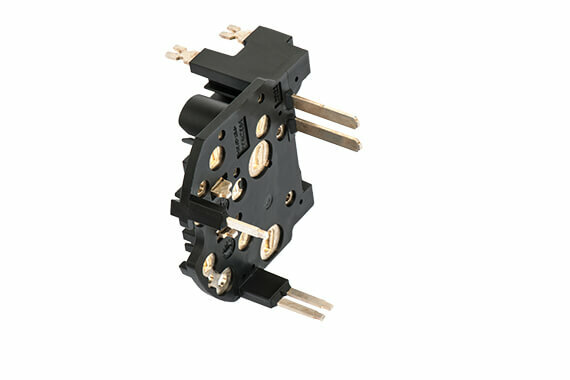 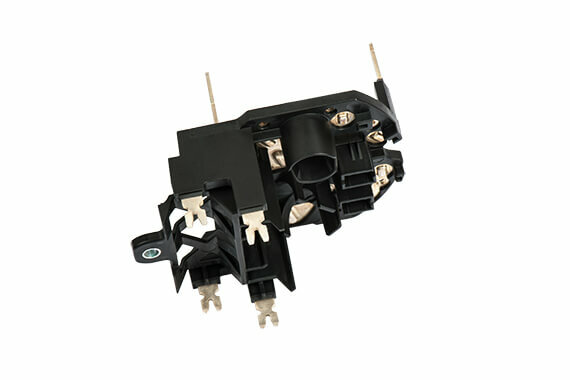 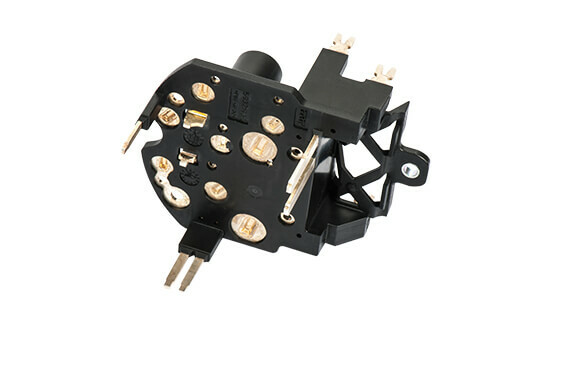 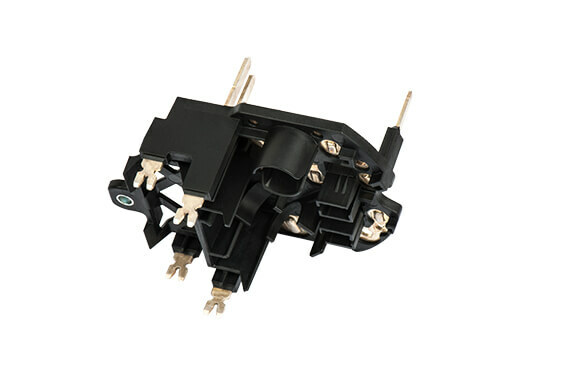 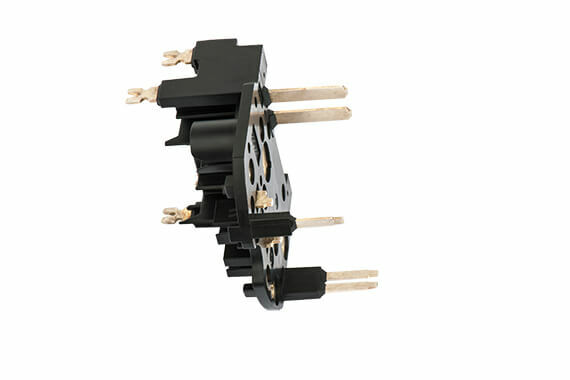 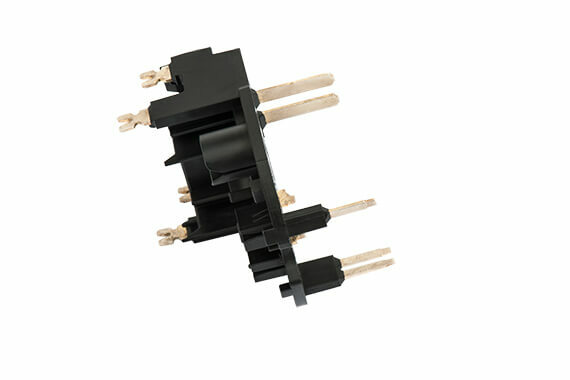 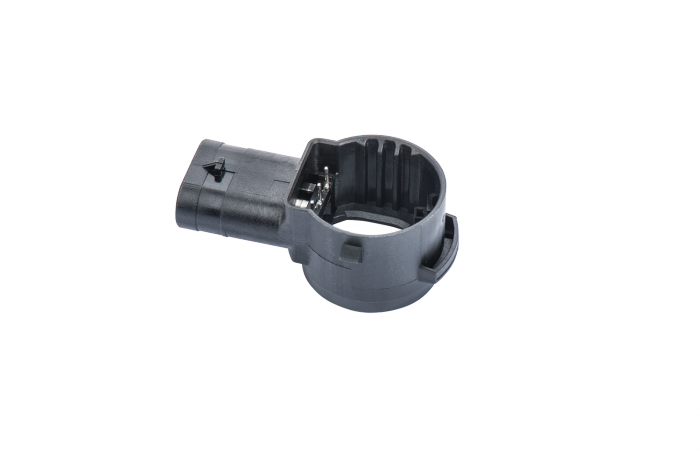 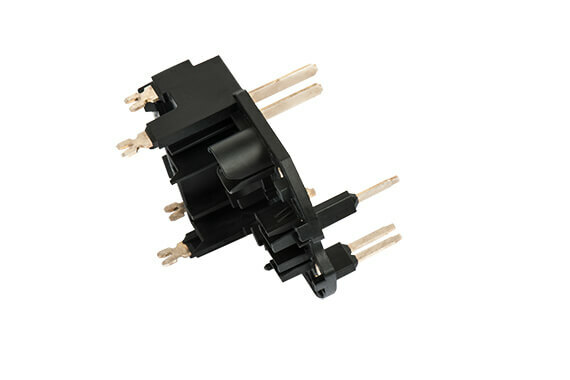 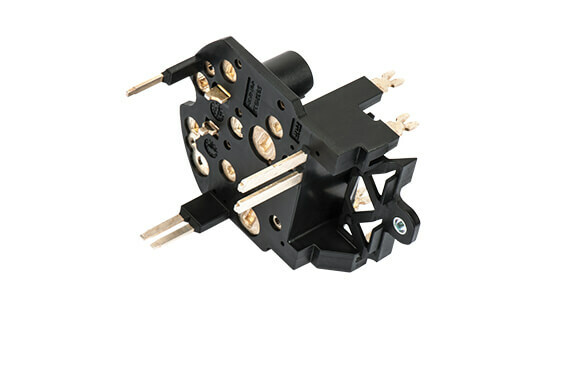 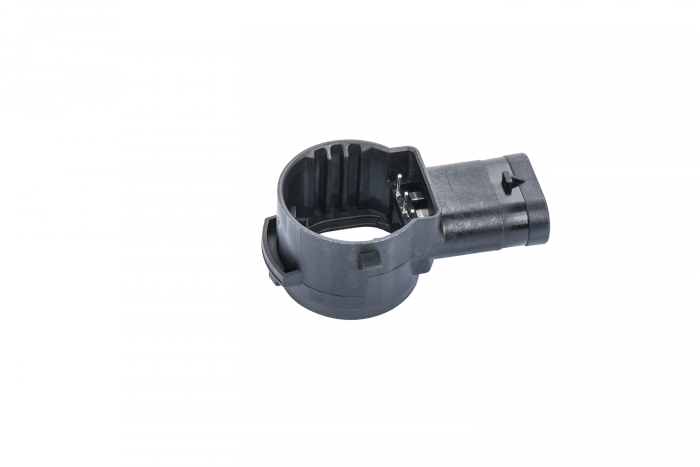 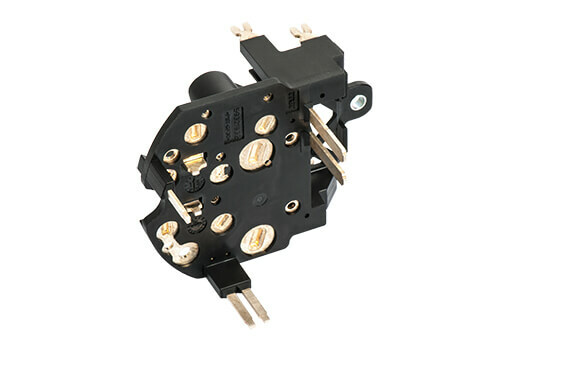 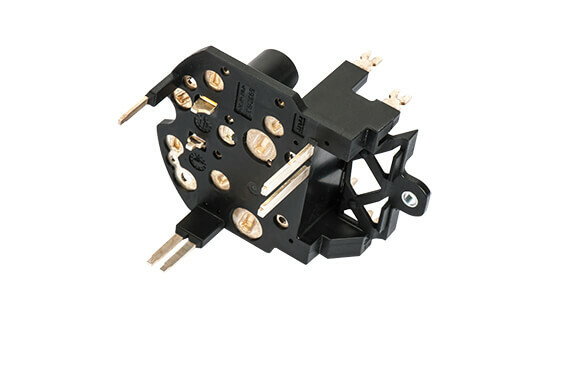 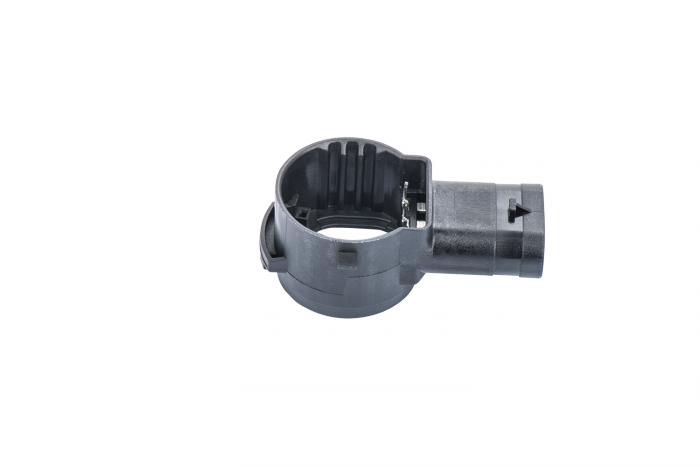 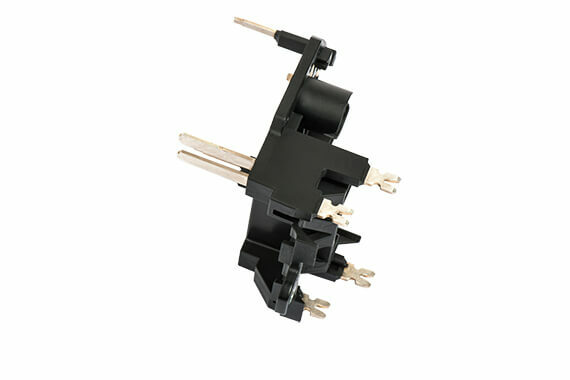 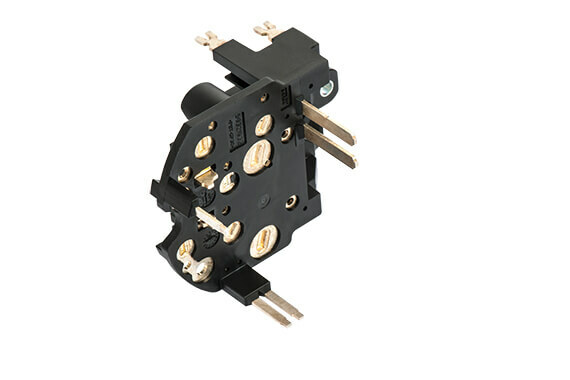 In the course of the manufacturing process, connector housings are equipped with the contacts. 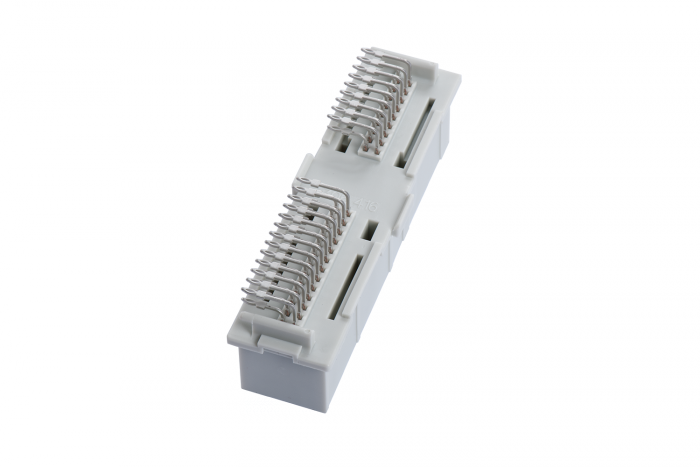 At Promotech, several of these production lines are currently running. 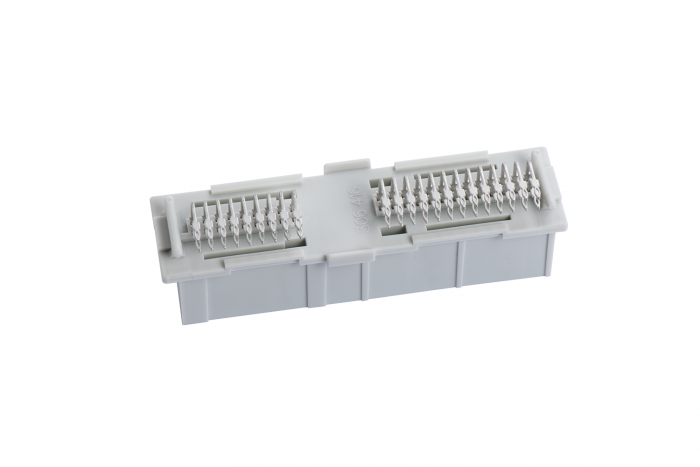 Prior to delivery every individual connector is automatically inspected and controlled. 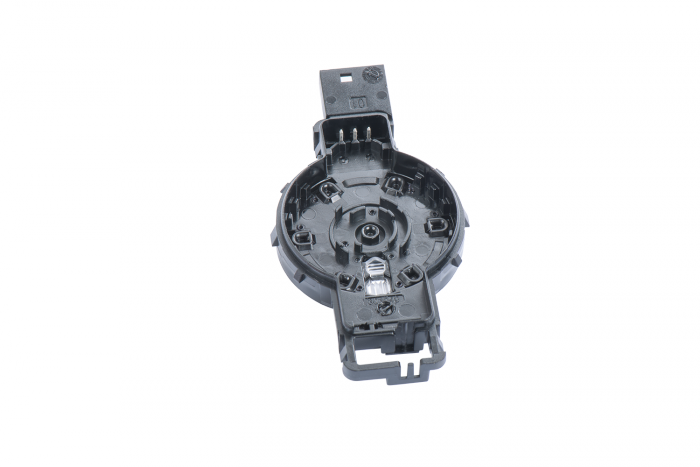 The leadframe represents the central mounting device for the electronic steering. 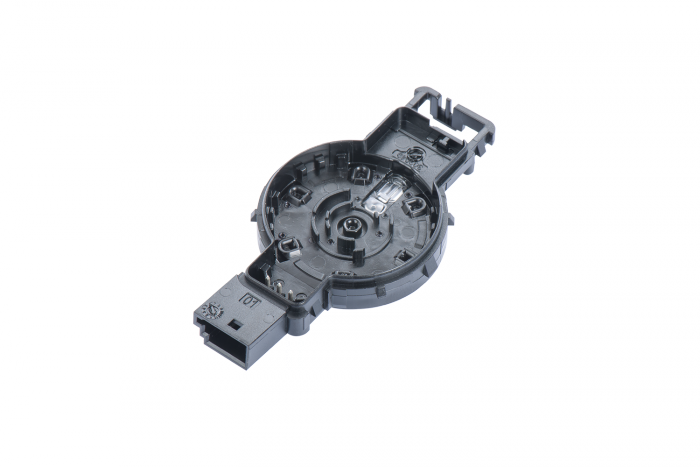 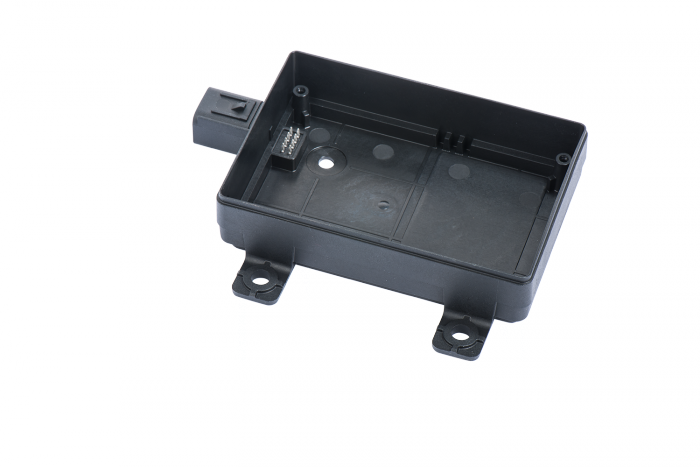 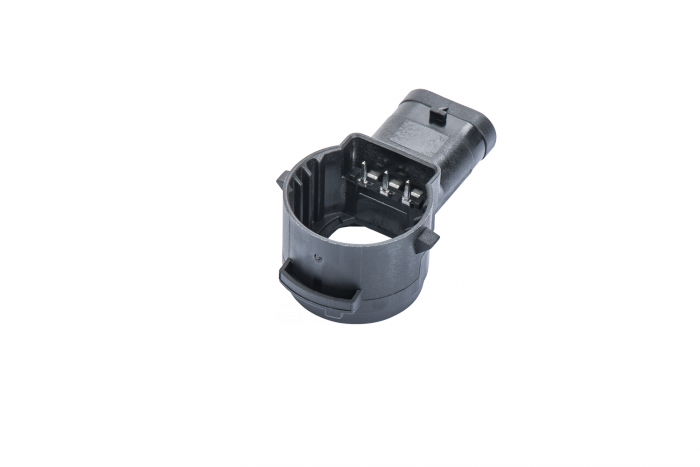 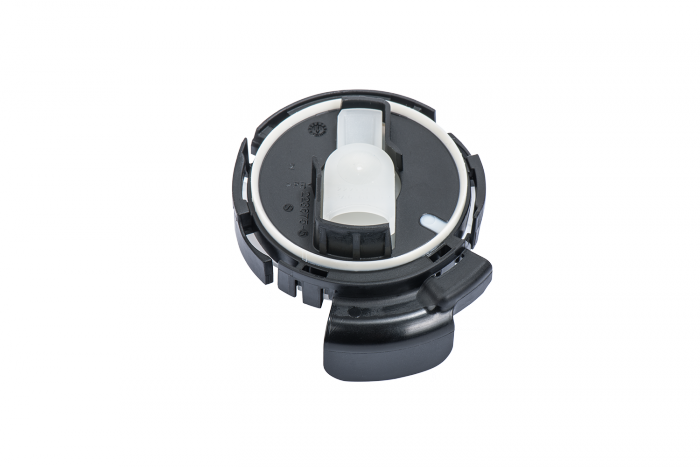 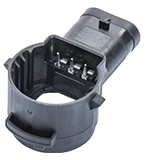 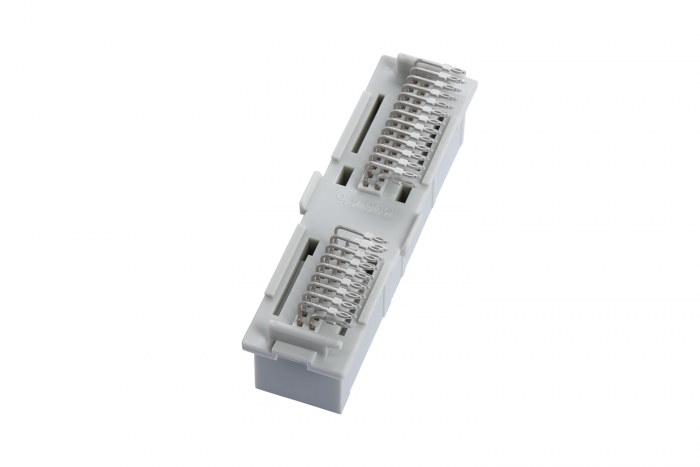 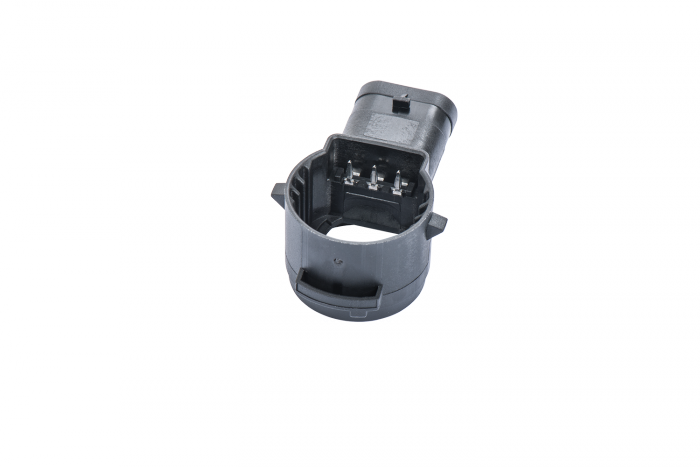 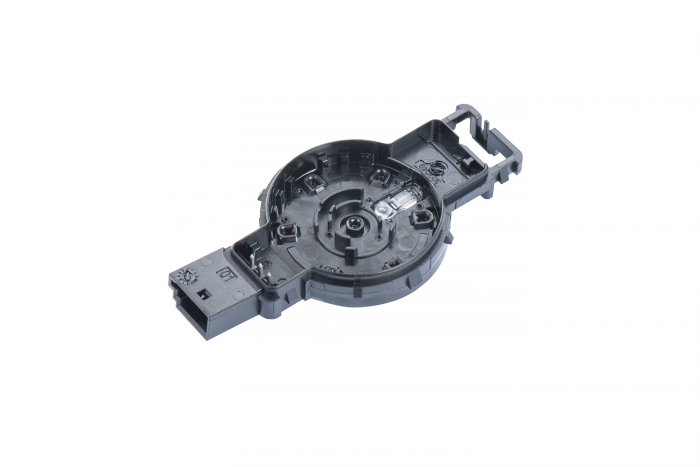 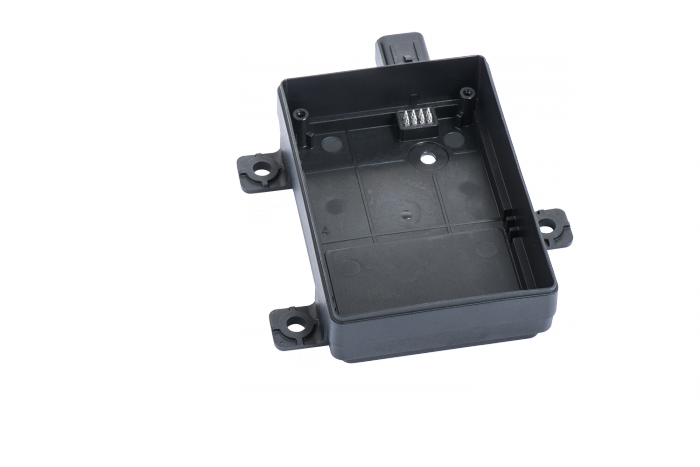 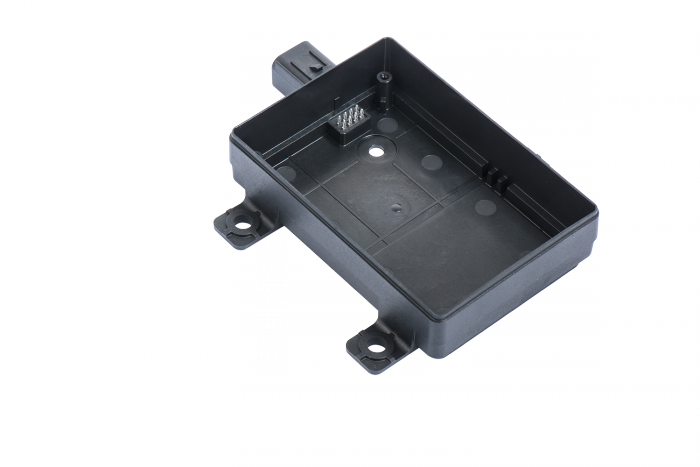 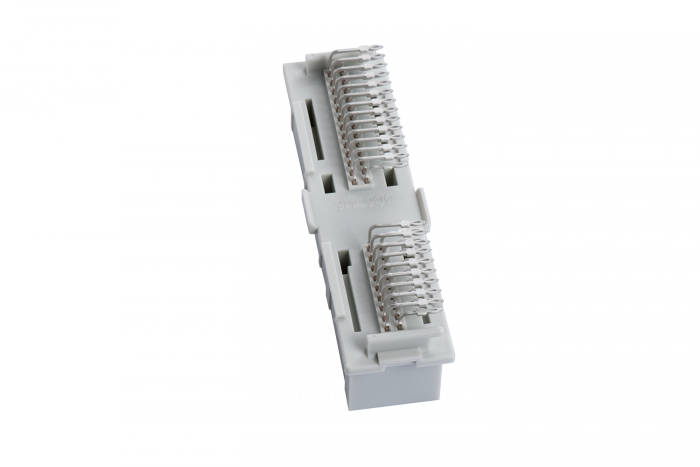 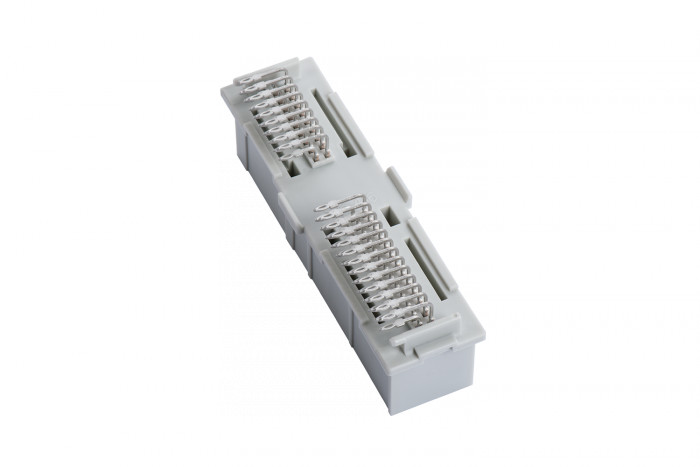 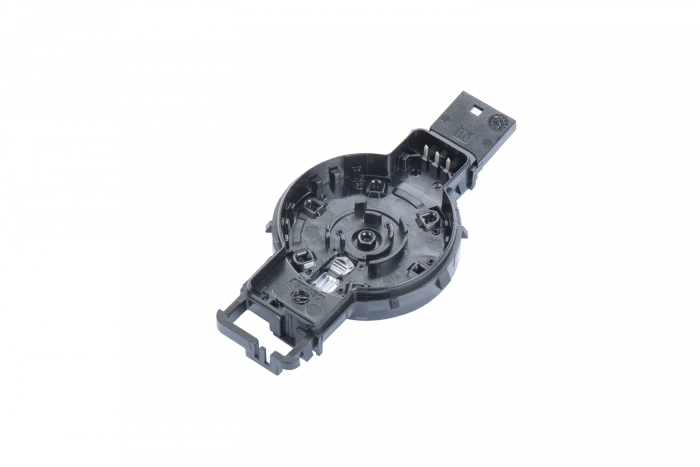 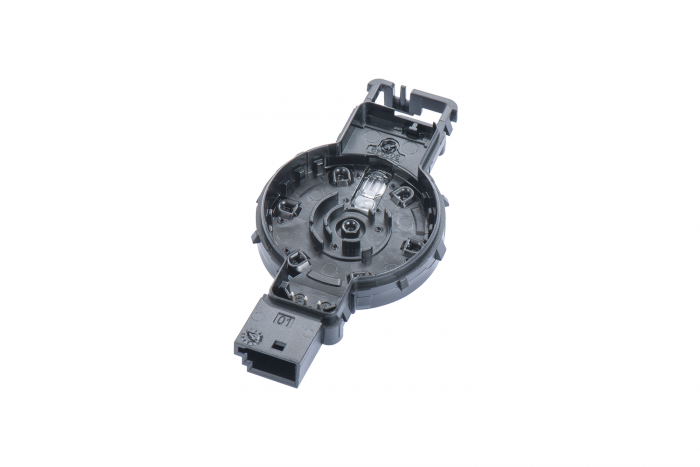 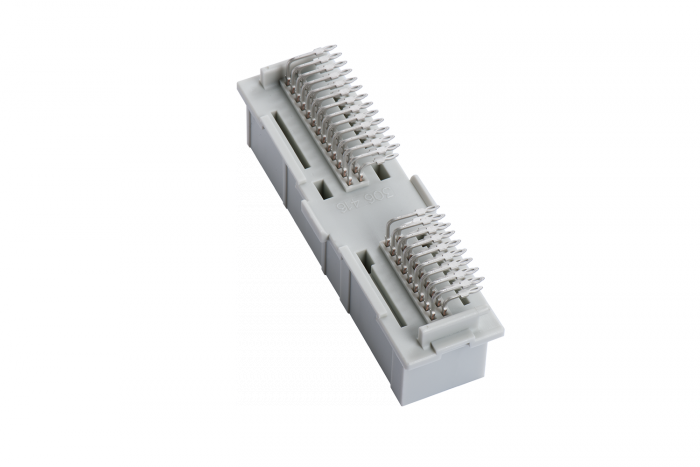 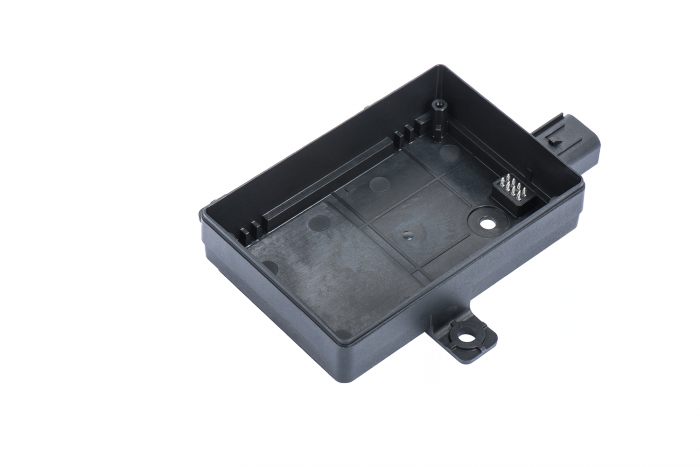 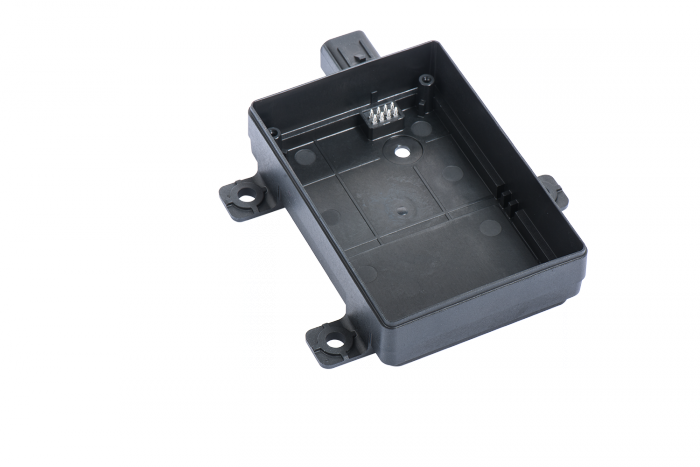 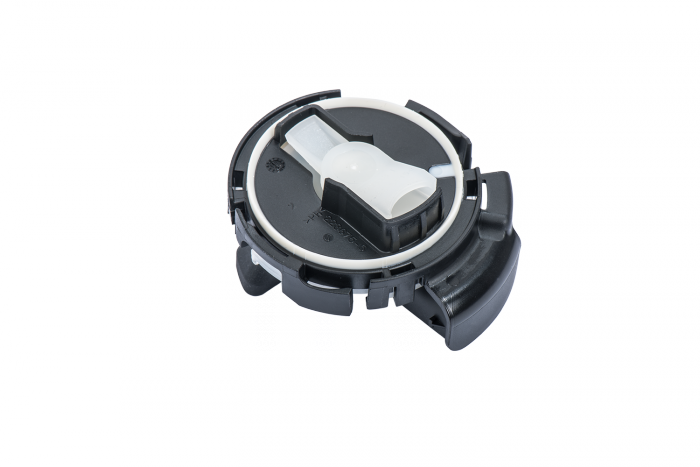 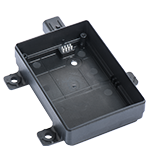 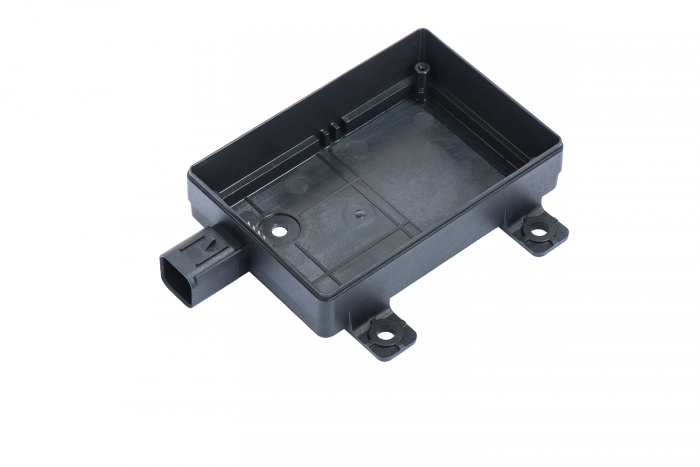 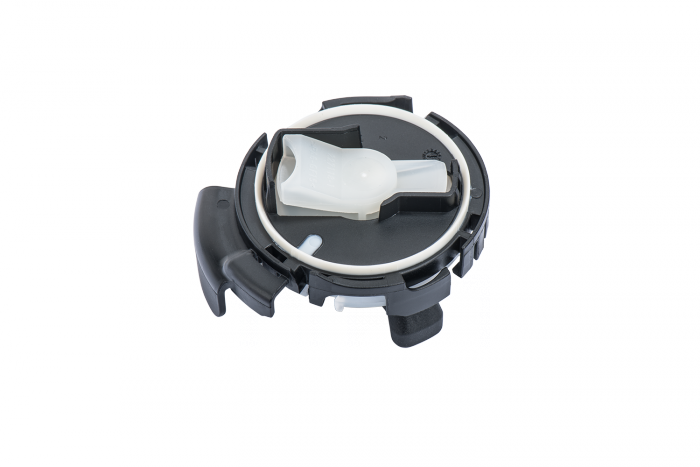 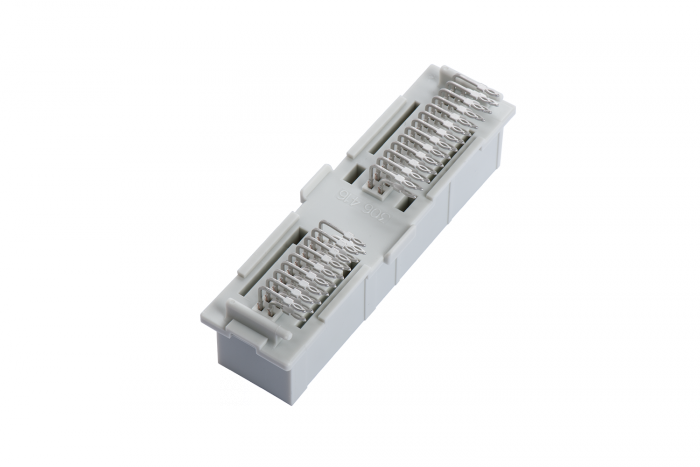 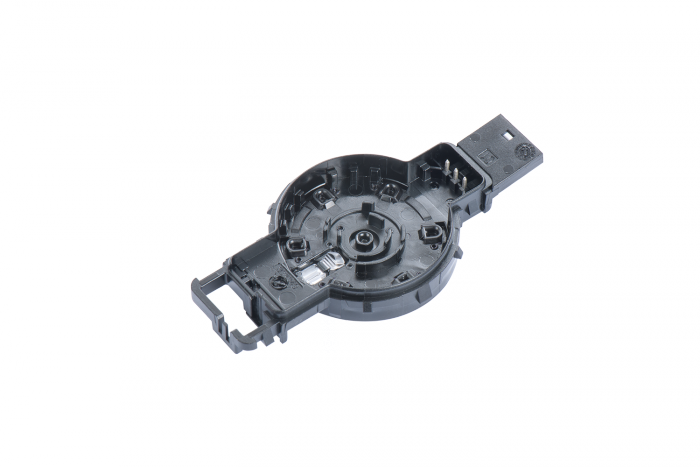 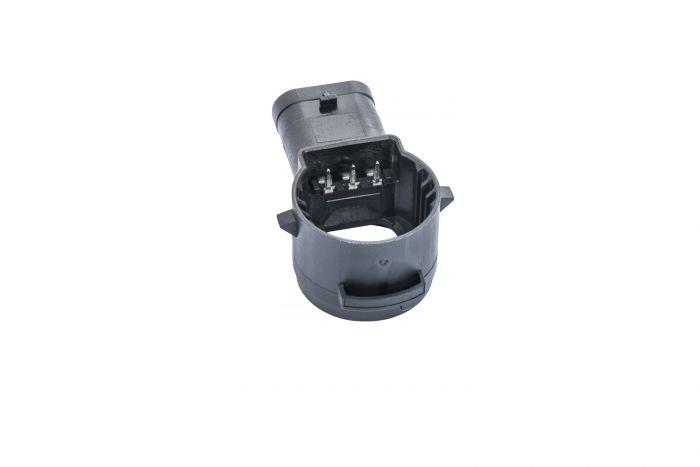 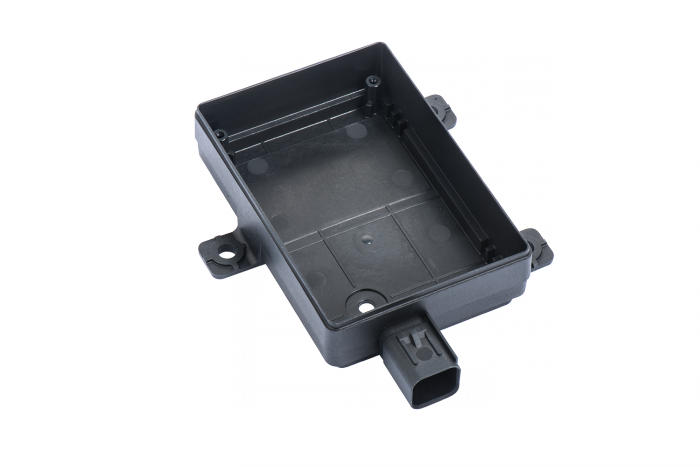 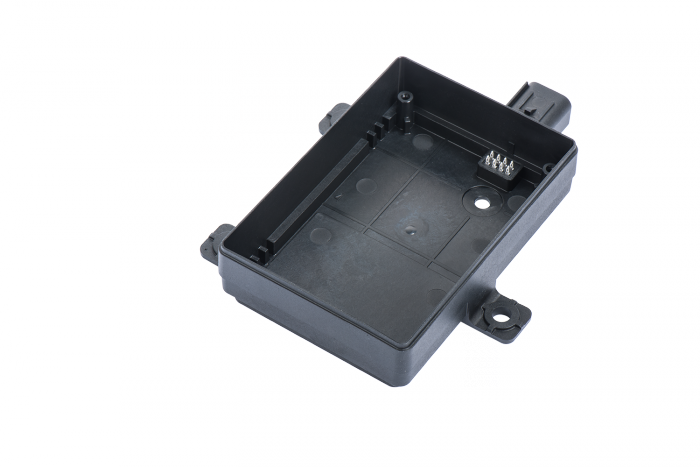 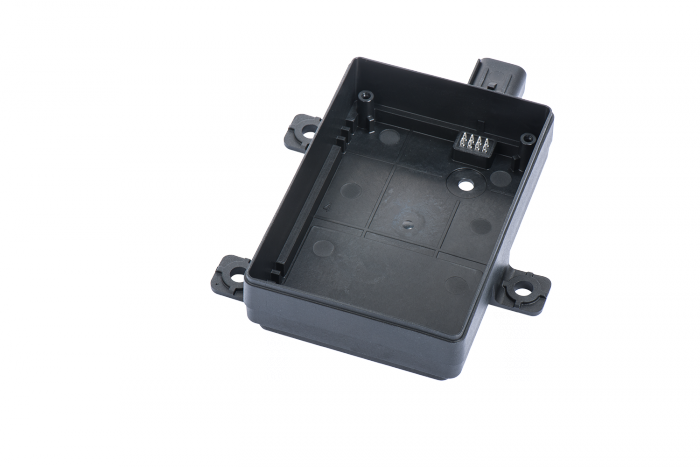 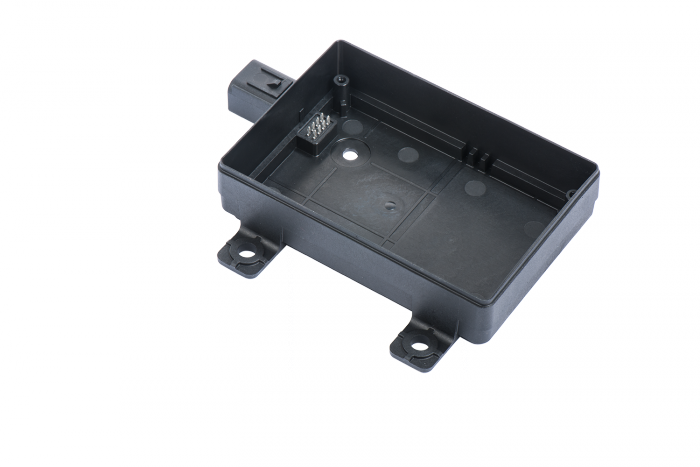 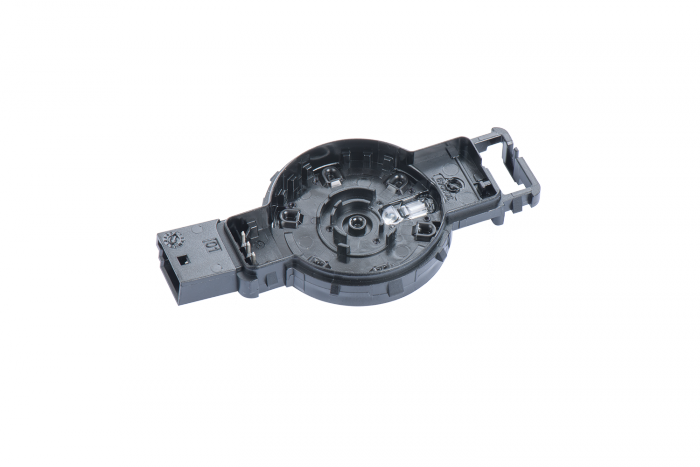 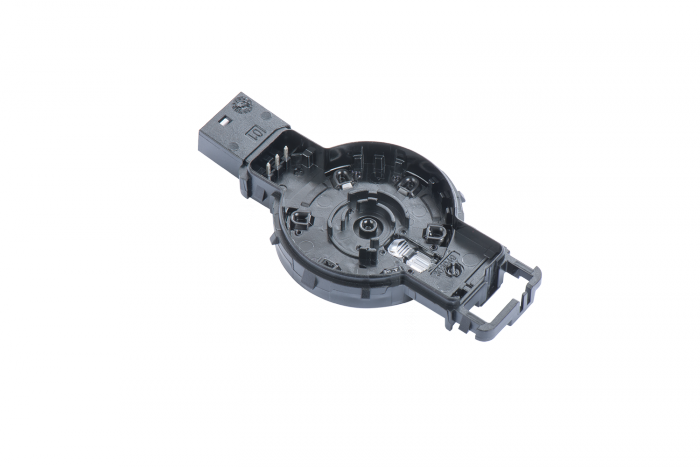 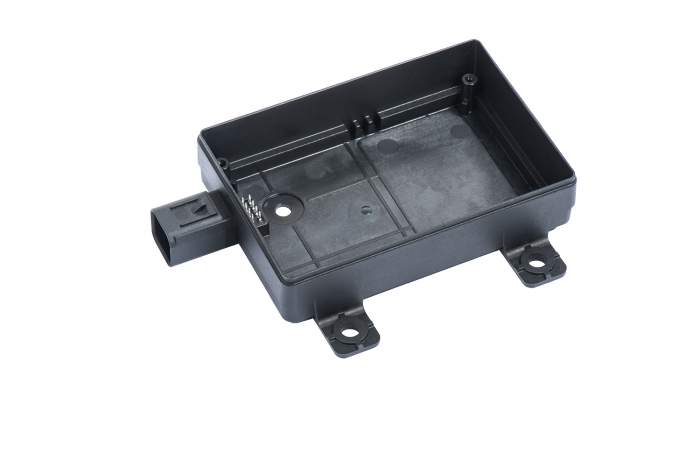 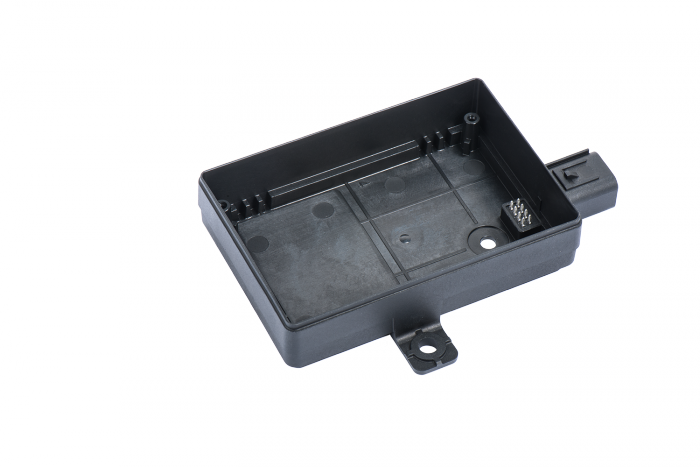 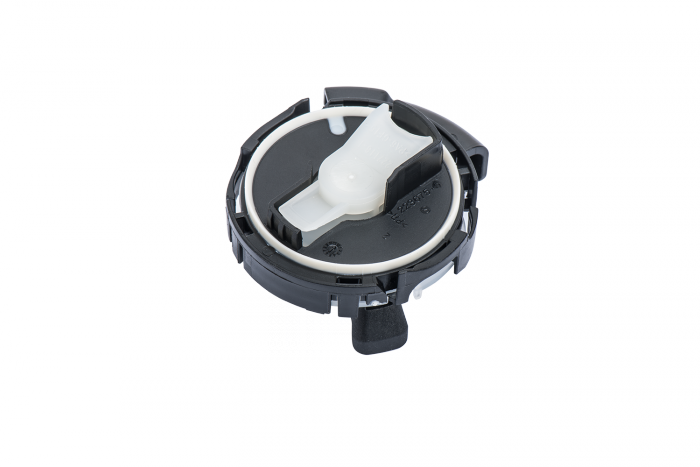 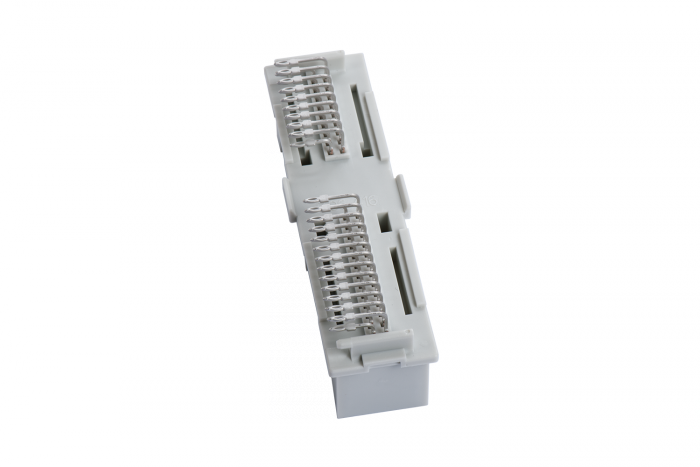 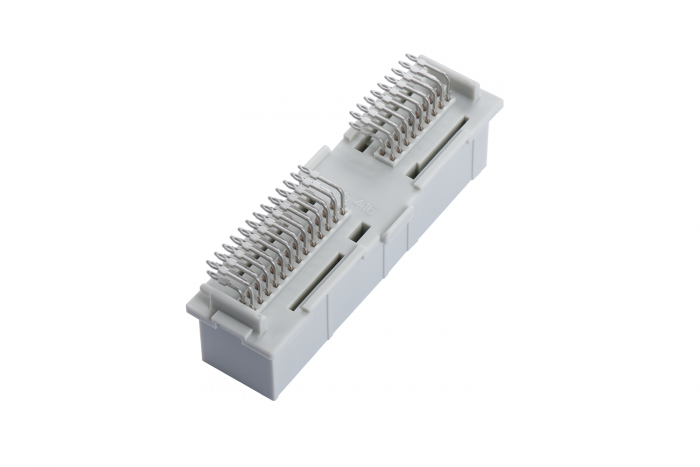 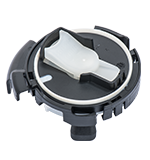 Promotech provides a total of eight injection molding punched grids of ultimate precision for electronic steering, each of them equipped with up to 10 different contacts, from the simple plug up to the mounting device for the motor coils. 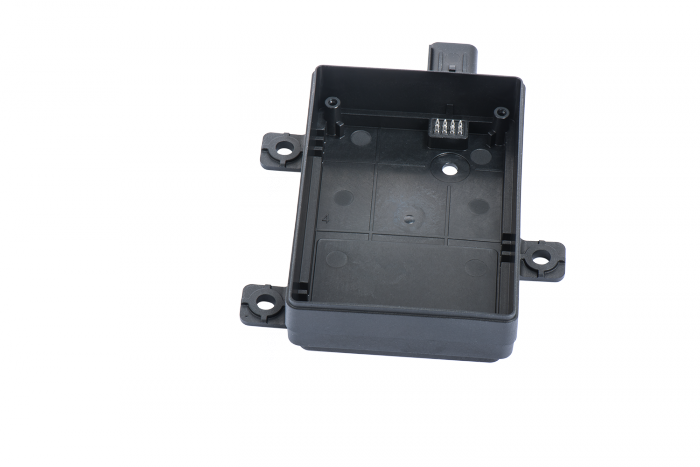 In the process, the steering impulse is transmitted from the steering wheel via various sensors to the motor for the power steering. 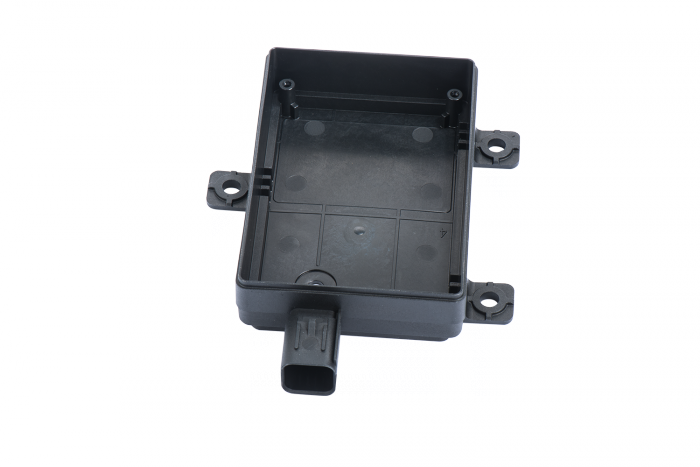 In this area, the precision requirements both for the punched grids and the injection molding components are extremely high. 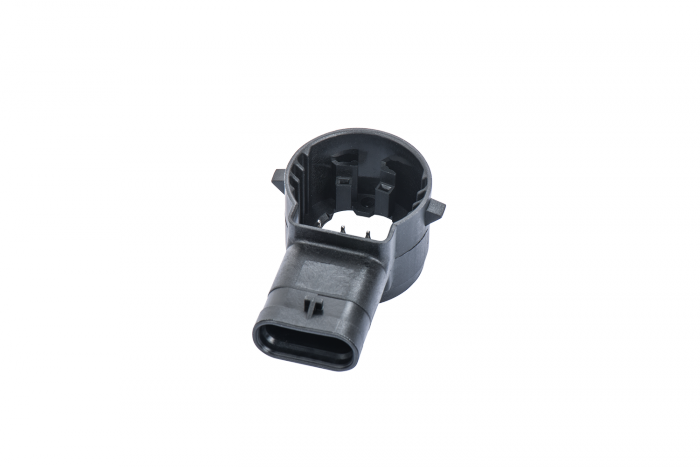 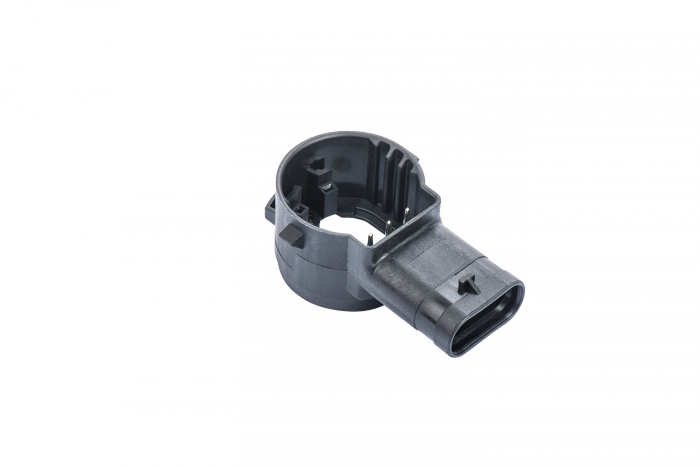 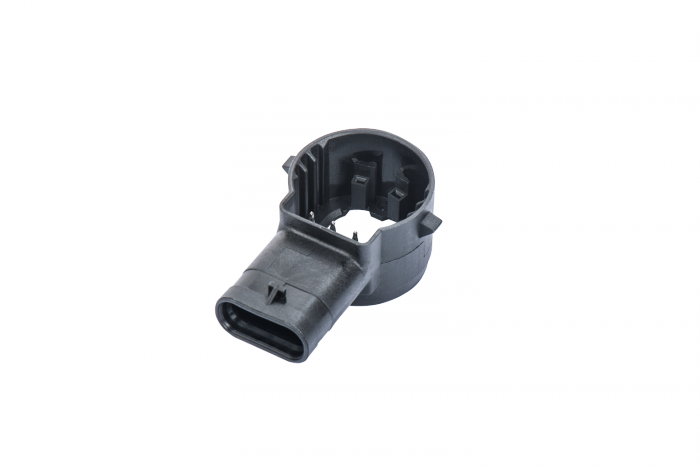 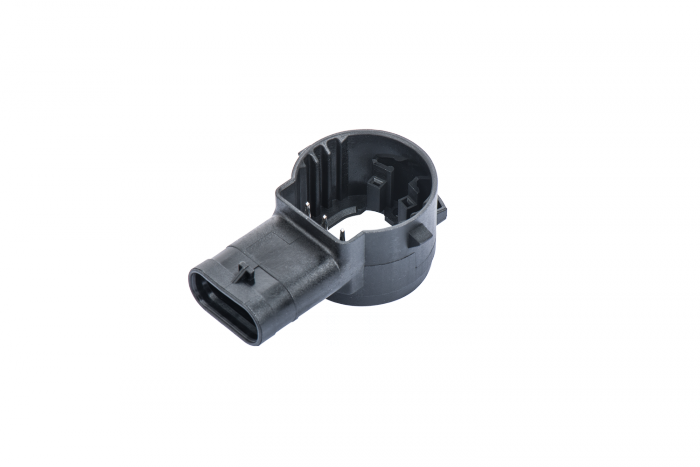 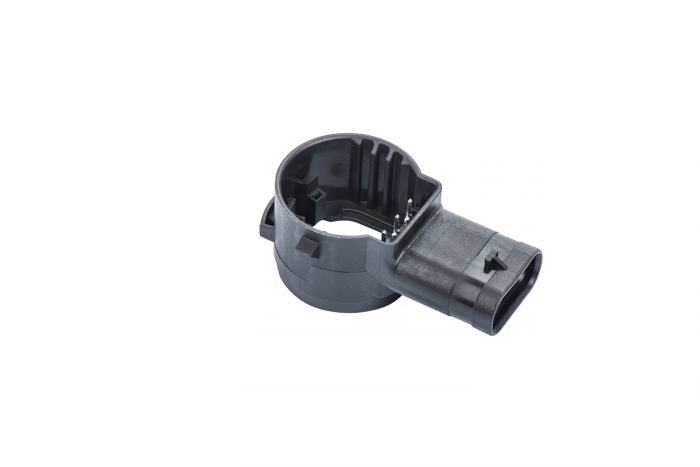 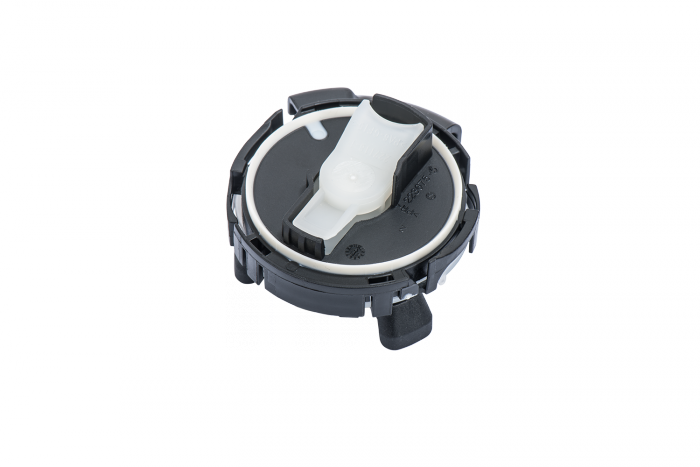 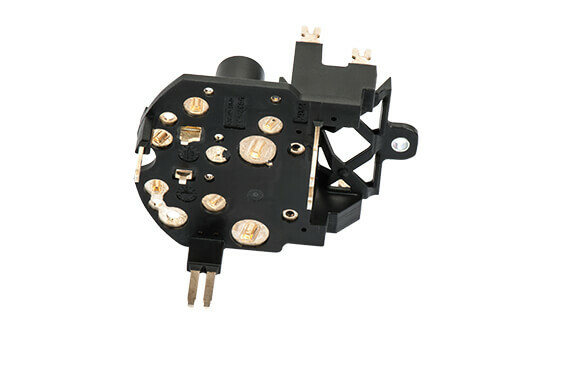 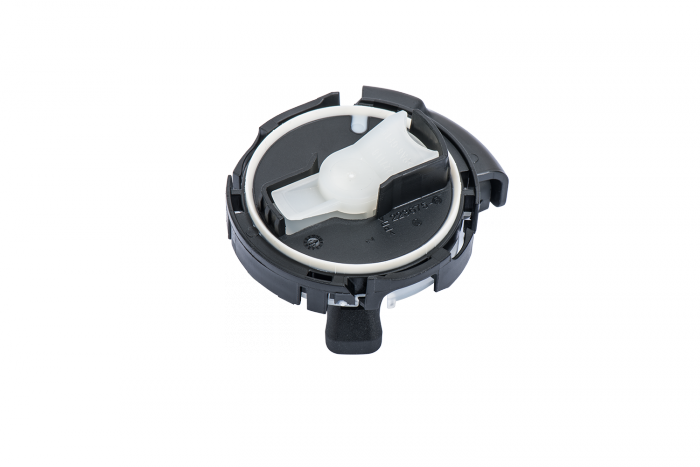 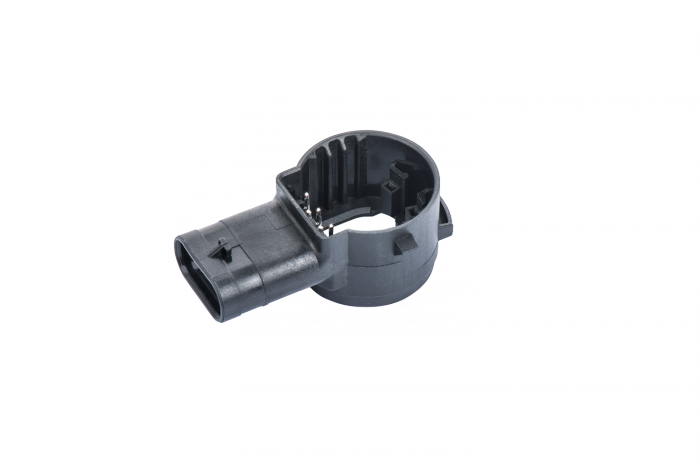 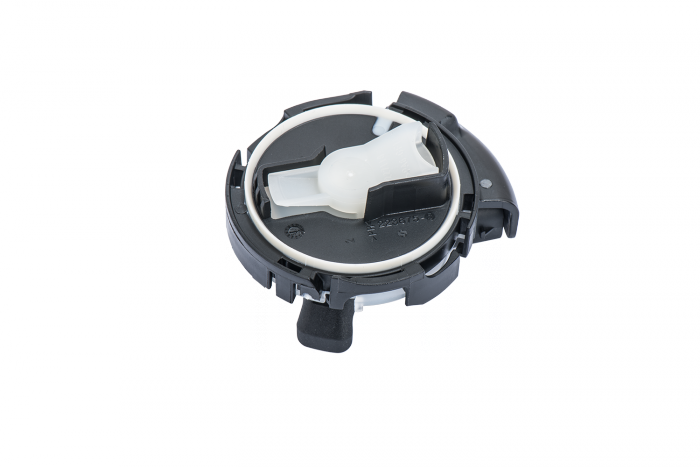 In the event of a side impact, the air pressure sensor activates the airbag: the impact leads to a change in the air pressure, this change is registered by the sensor and the trigger signal is subsequently transmitted to the airbag control. 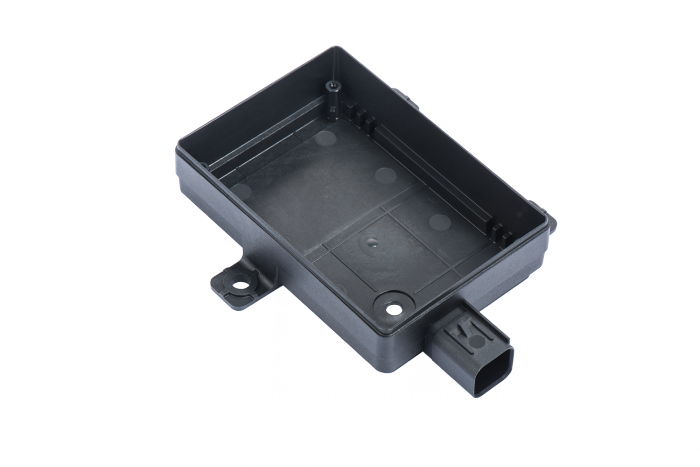 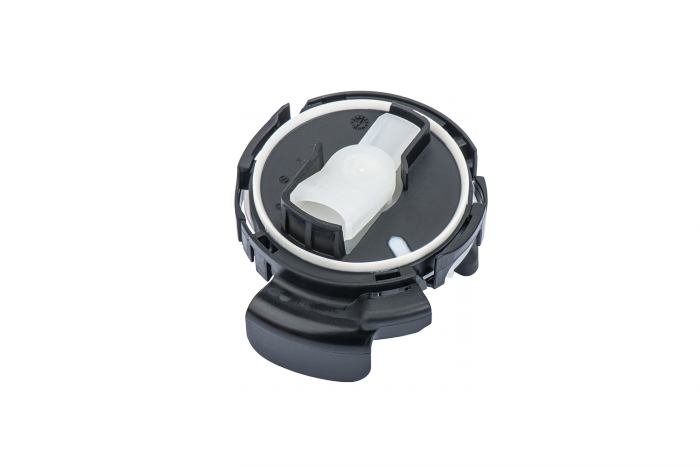 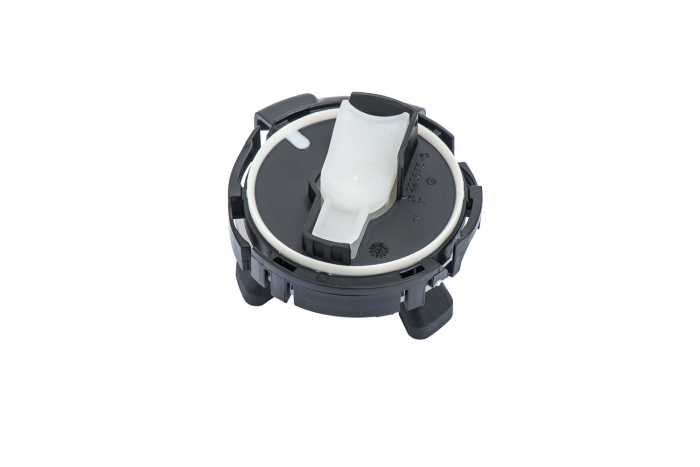 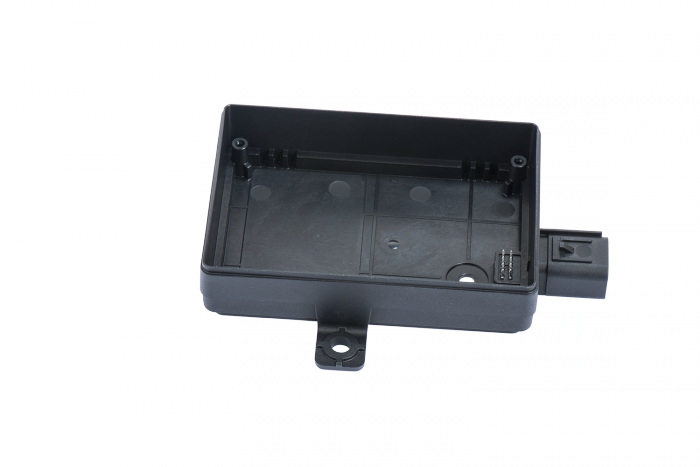 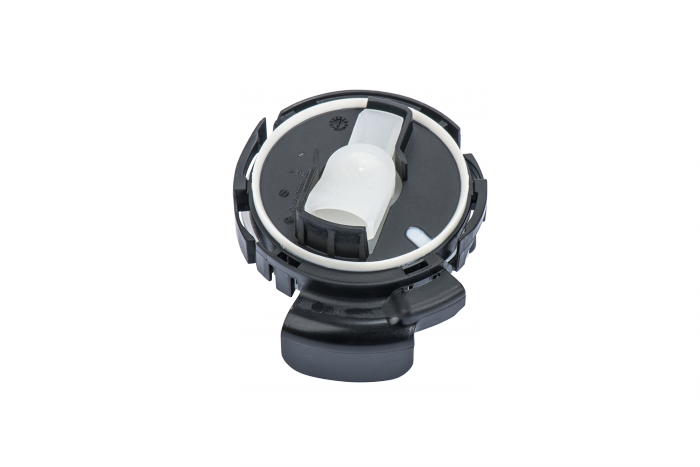 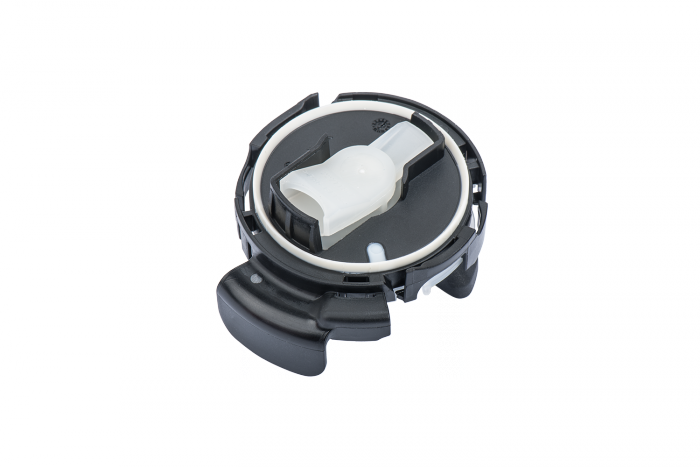 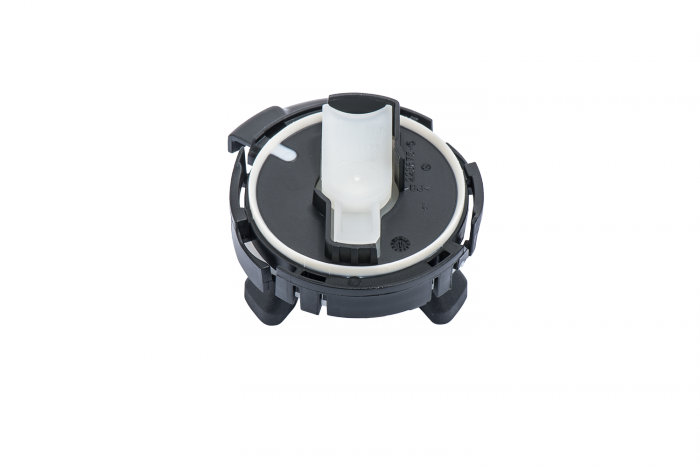 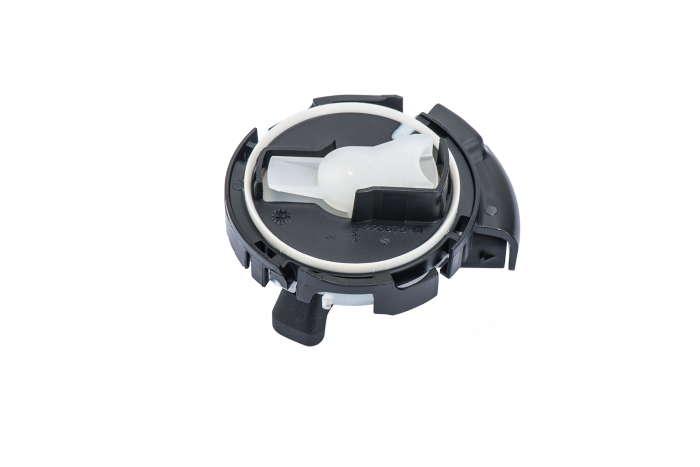 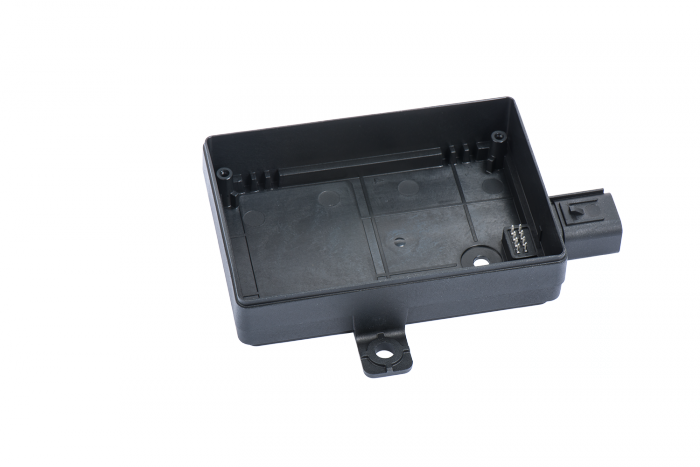 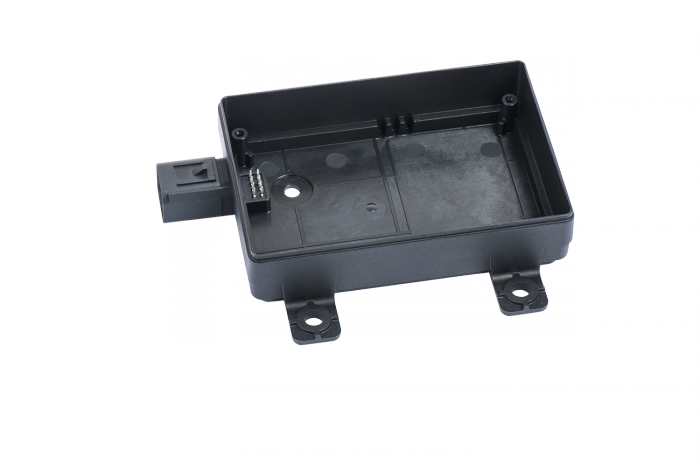 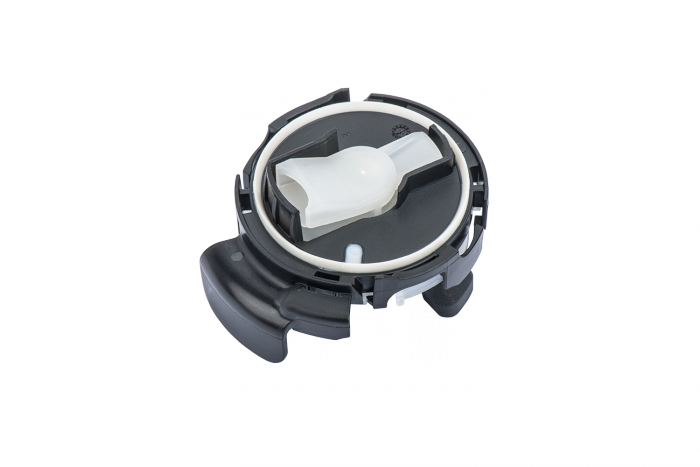 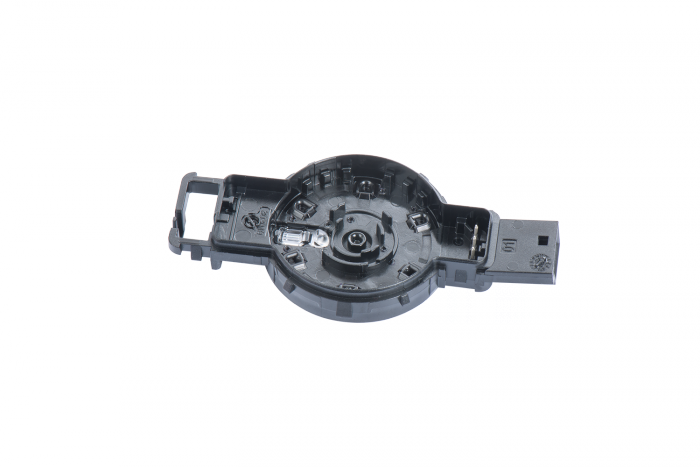 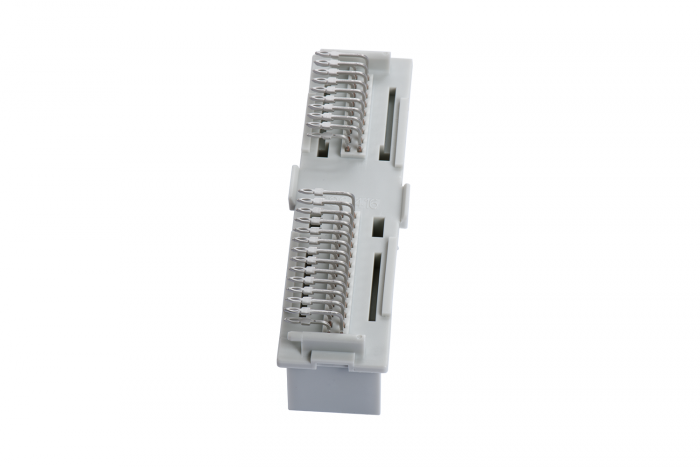 The component consists of three different plastic parts, sealed up by means of a 2-component injection molding and, in addition, a further sealing is inserted. 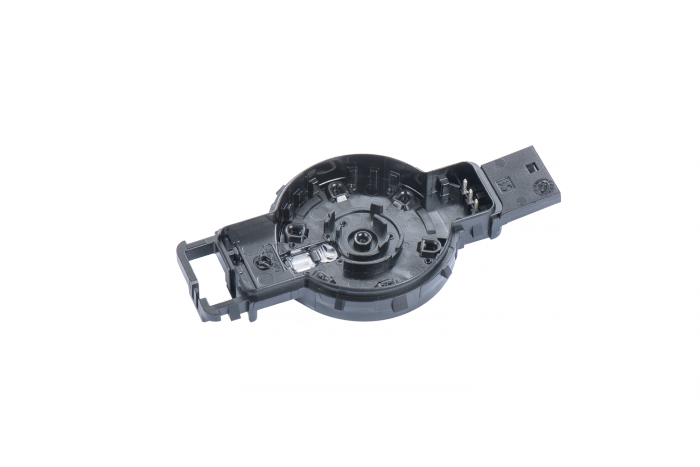 Overmoulded contacts constitute the interface to the control. 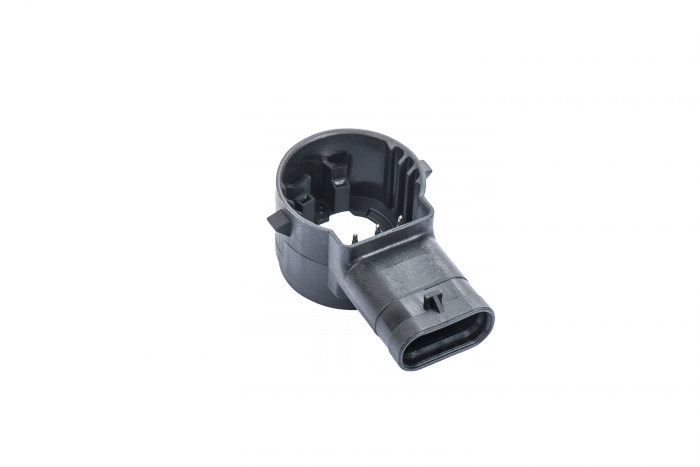 Detection of light conditions (control of the turning on and off of the headlights) and rain intensity on the windshield (control of the intervals of the windshield wiper) as well as moisture measurement on the inside of the windshield (control of the ventilation). 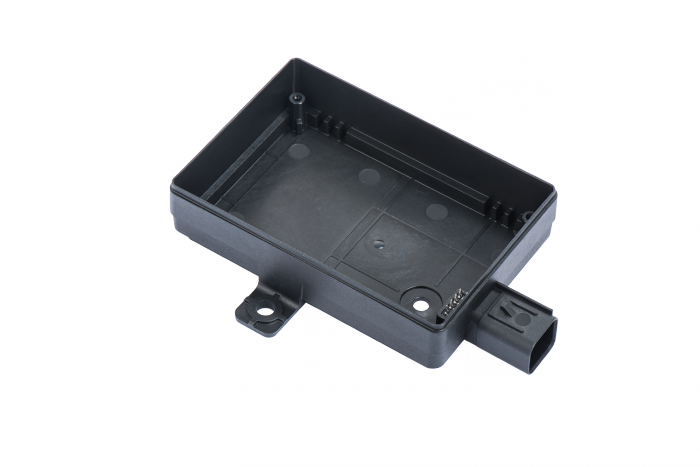 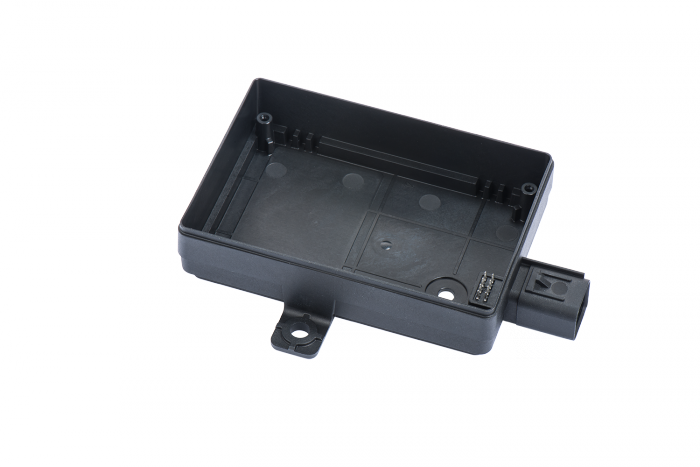 In one single production step three different polycarbonates are used to build both the optical elements and the housing; the overmoulded contacts form the interface between the print circuit board and the control unit. 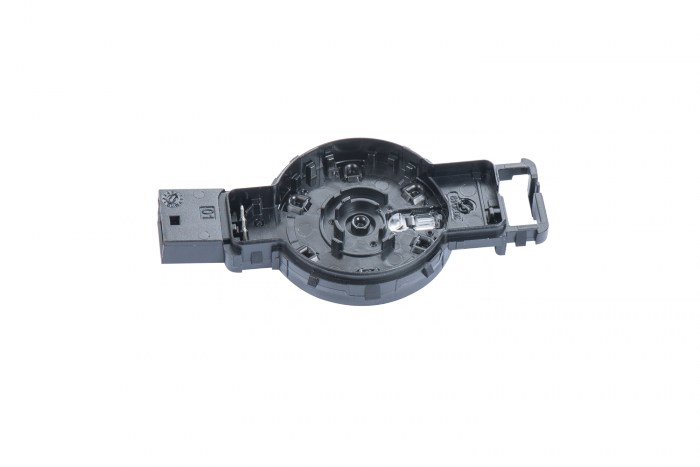 Positioning: on the windshield. 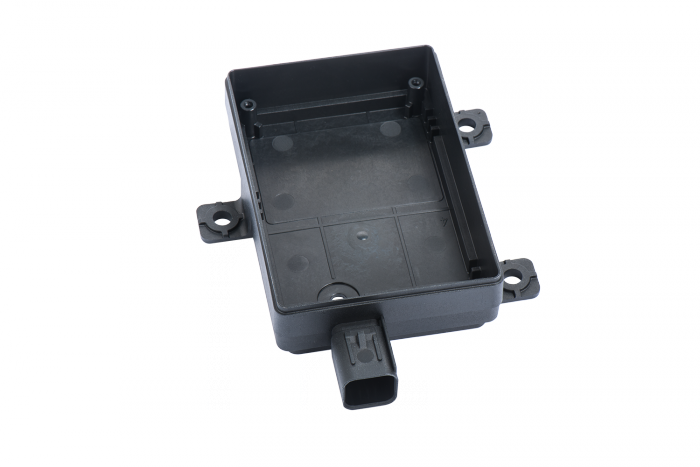 The 2-component radar housing serves as control unit housing for the radar sensors in the front and the rear, designed to help avoid rear-end collisions and to regulate the speed. 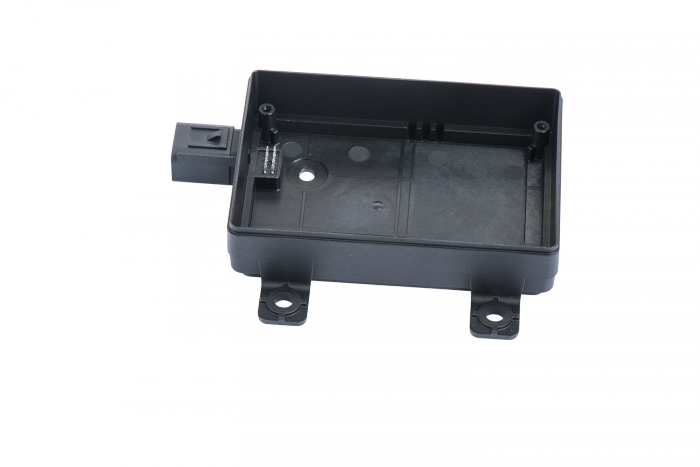 The housing consists of a conductive and a non-conductive component. 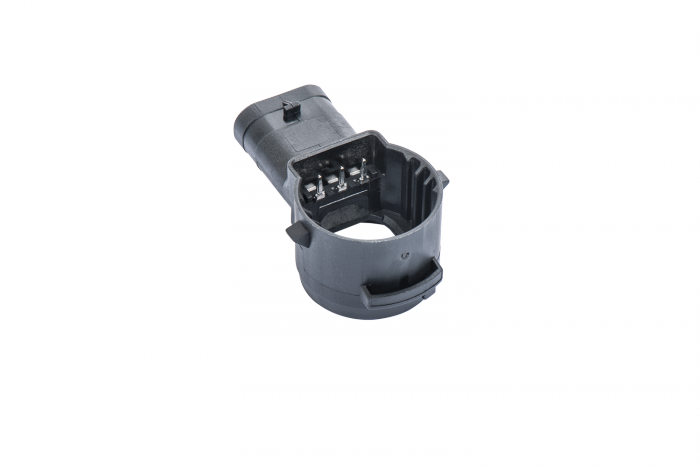 By employing this mix of materials it is possible to ensure the orientation of the radar beams. 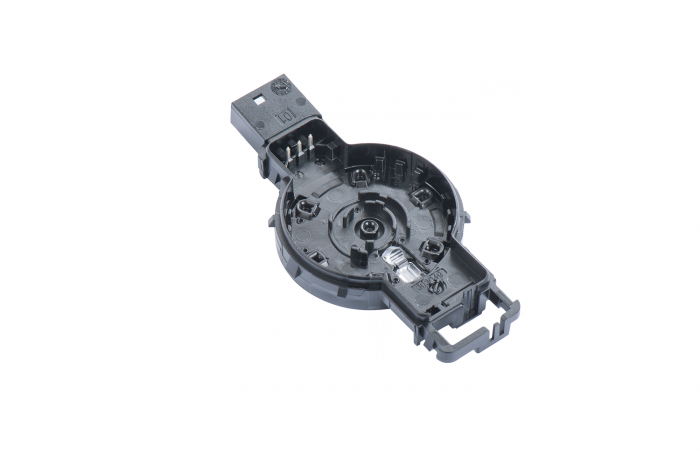 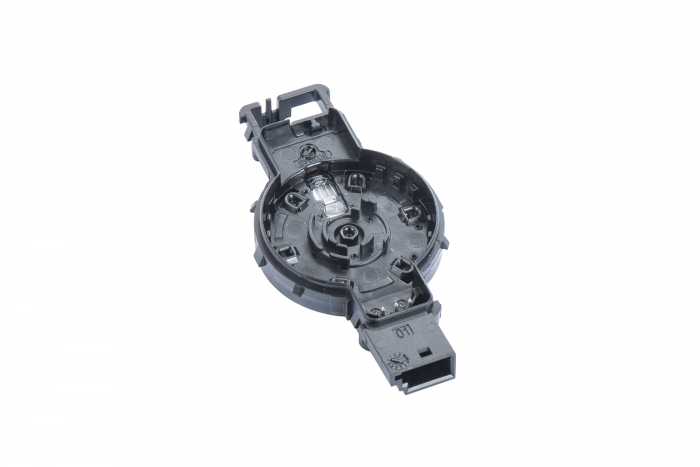 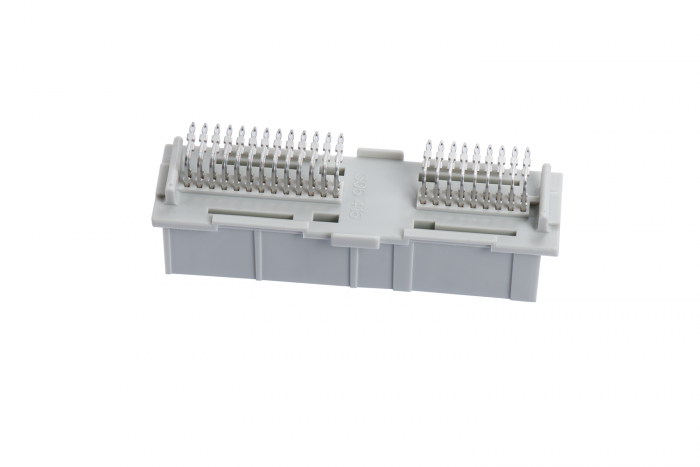 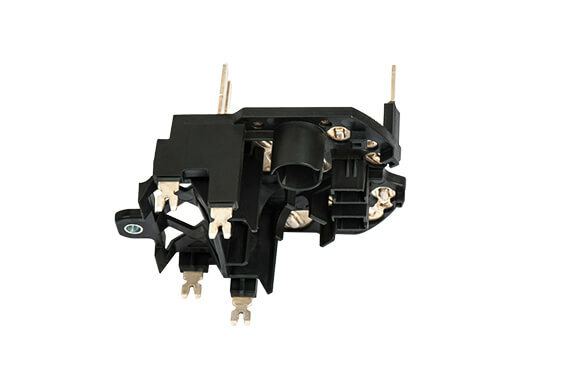 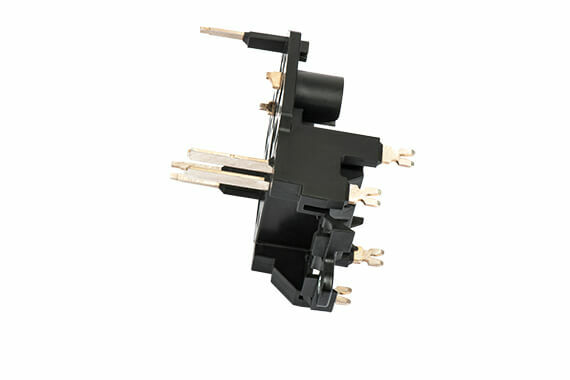 The connection to the electronics is effected by means of 8 overmoulded press-fit contacts. 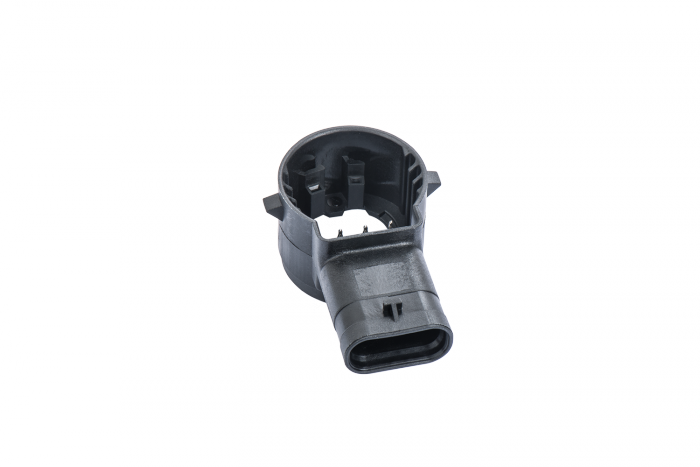 Parking sensors send out acoustic waves as distance warning aids, thus facilitating parking. 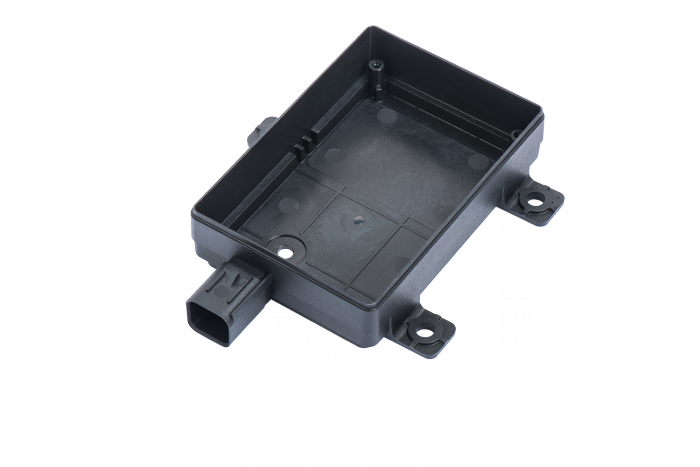 The housing consists of 3 contacts with press-fits, with the required welding surfaces and interfaces demanding utmost precision. 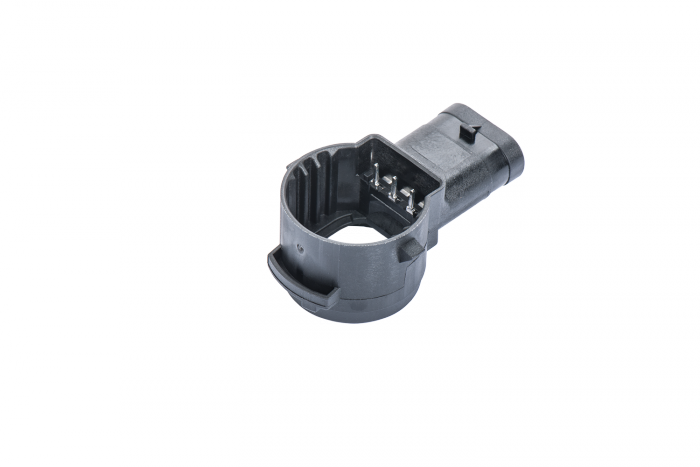 The major challenge in this component lies mainly in its size, coupled with the tight tolerance requirements and the high volumes. 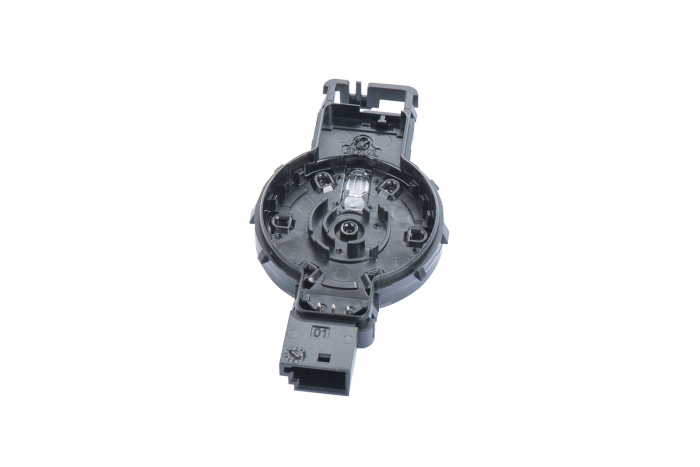 The components are manufactured in fully automated production lines and optical as well as mechanical monitoring and control systems perform a 100% inspection of the parts immediately after their manufacturing. 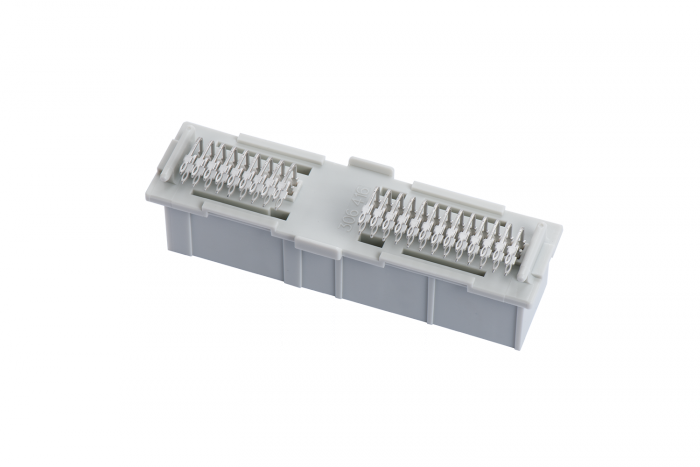 In addition, also the fully-automated packaging of the components is performed in the production line. 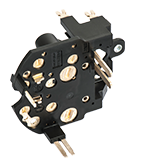 Longstanding partnerships with national and international customers characterize our work. 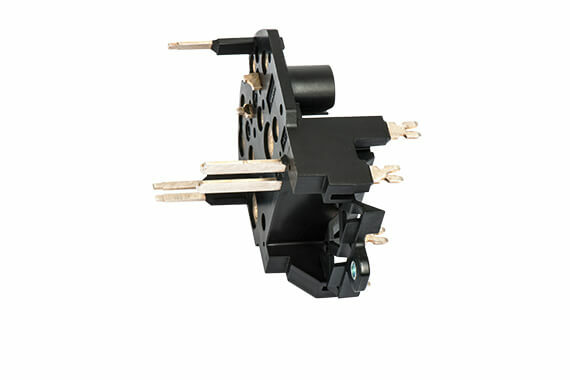 We are the perfect partner for a long-term cooperation: reliable and financially stable. 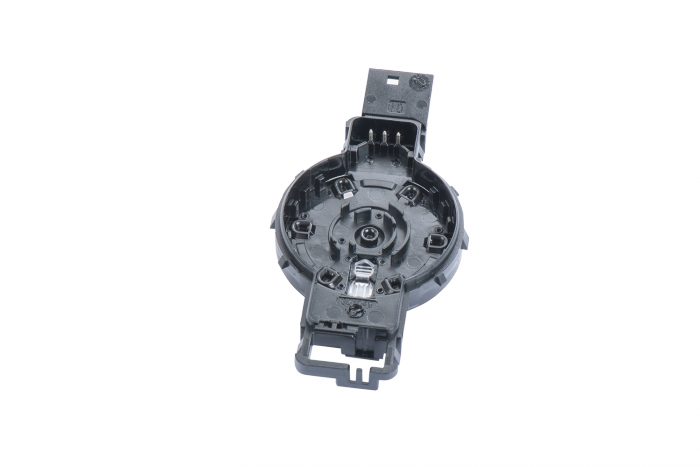 Our products are used by all leading automotive suppliers worldwide. 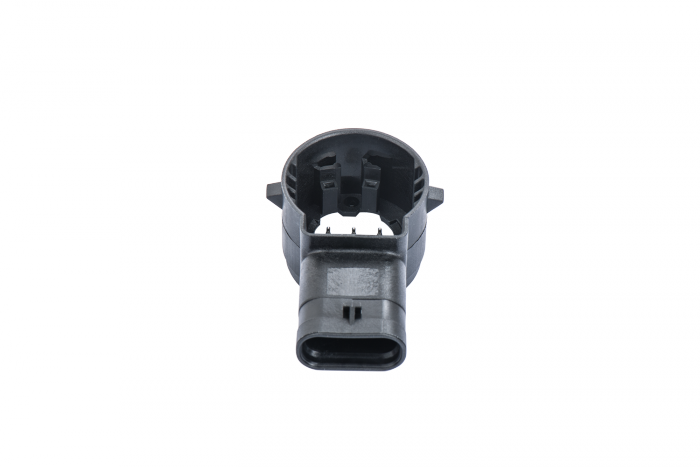 You will find Promotech products in cars made by VW, Daimler, BMW, Fiat, PSA (Renault, Citroen), Ford, Bugatti, Ferrari and Porsche.